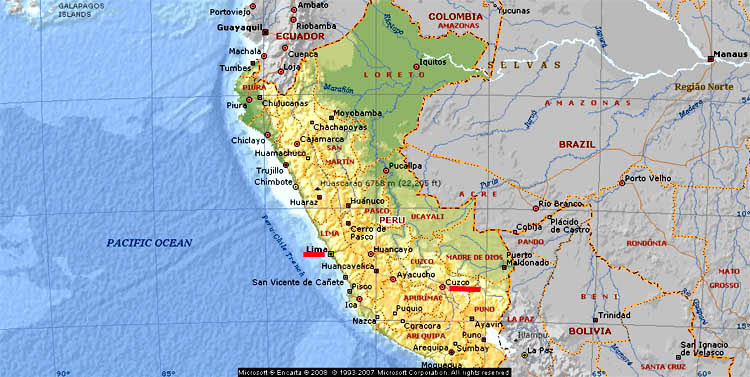 This is an abridged description of a trip to and through a part of Peru (see maps below) during October 2000. The intention is to give a firsthand personal experience of how I did get to and through the country in 18 days. Not many days for a sight-seeing tour, not to mention any adventure. And it was even less than that for that because I had to learn Spanish during 10 days of those 18 days. Anyway, better than not going on this trip at all, because it was an additional education vacation every employee was entitled to if he can prove that he is attending a course for his personal enlightenment, according to the law of some states in Germany at that time. 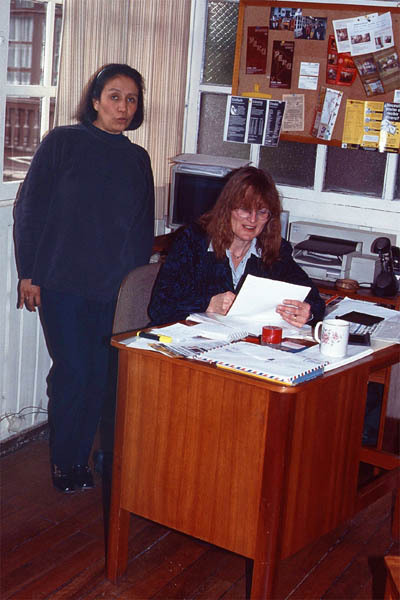 The employer, however, was more strict by only allowing a course to improve skills useful to the company. I could convince them that speaking a little Spanish will have a positive effect on the relationship (and thus better business results) with my Spanish colleagues during my business trips to Spain. This sounds the same as my trip to Ecuador two years ago. Since I was only entitled to one week per year for an education vacation I had to combine two years to get two weeks together. At the time of writing all this, more than 10 years have passed, thus I cannot recall the overall cost, not to mention the prices of hotels, restaurants, bus fares, etc. But this time I could not reduce my taxable income by all expenses incurred, because the Department of Revenues did not accept it anymore all of a sudden. What a pity. 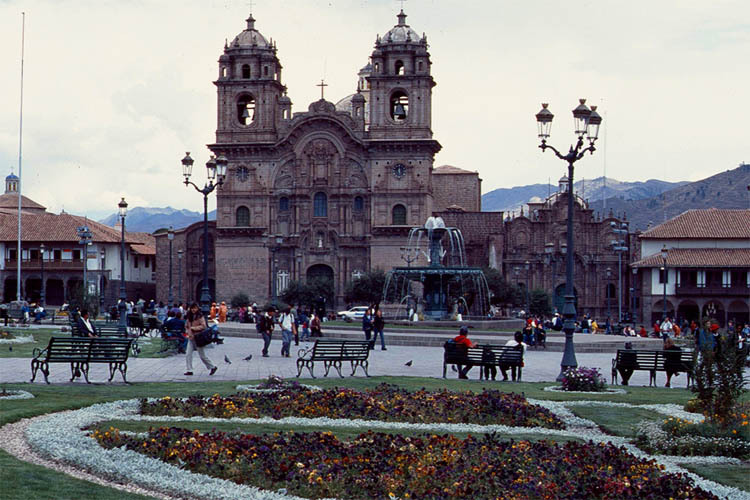 The cheapest flight I could get was with KLM from Amsterdam via Aruba to Lima, the capital of Peru, where I arrived in the late evening of a Friday. I was supposed to be picked up at the airport, but the driver was not there. So I asked a taxi driver to bring me to the house of my host. But he did not know, how to get there, despite the fact that I gave him the address. So he called and asked for direction. We arrived safely. This is not always the case in Lima, because there are some criminal taxi drivers, who have robbed their passengers. Thus the trusted pick-up service. We arrived in a very good neighborhood and Karl, my host, was already waiting in front of his house. He told me that his driver had called in the meantime that I did not arrive. Sorry, I definitely know that nobody was standing there holding up a sign with my name. There were around thirty of them which I have all read. 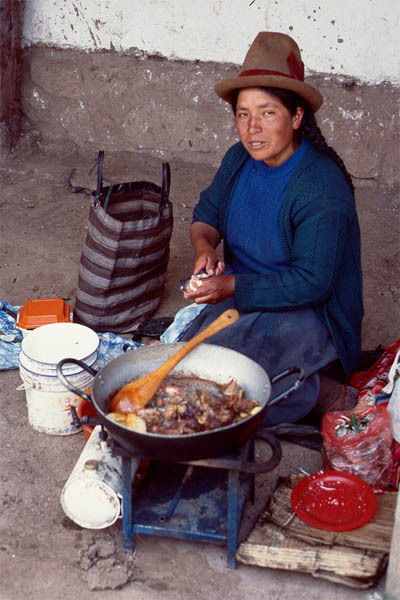 My host couple has already been living in Peru for a long time. He has founded a wholesale business of appliances and seemed to make good money. They are still very well connected with Germany by traveling back and forth once in a while. 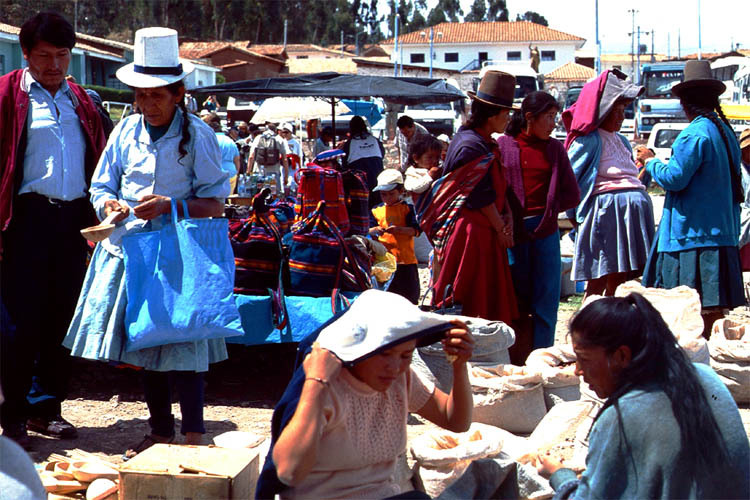 They are active in welfare projects and socialize within the German community all over Peru. 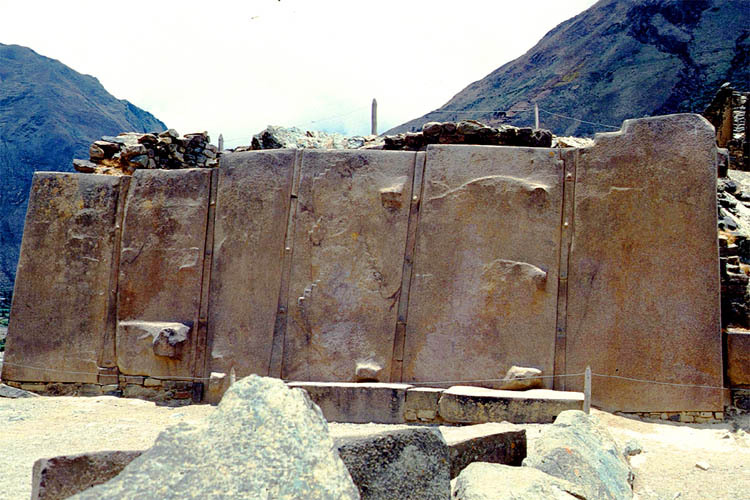 Thus the connection with the Consulat in Cuzco, of which the language school with the name of Acupari is part of it (more of that later). Next morning I was brought to the airport by the driver, who missed me the day before. He was still convinced that I arbitrarily ignored his sign. So what. I could not help it. 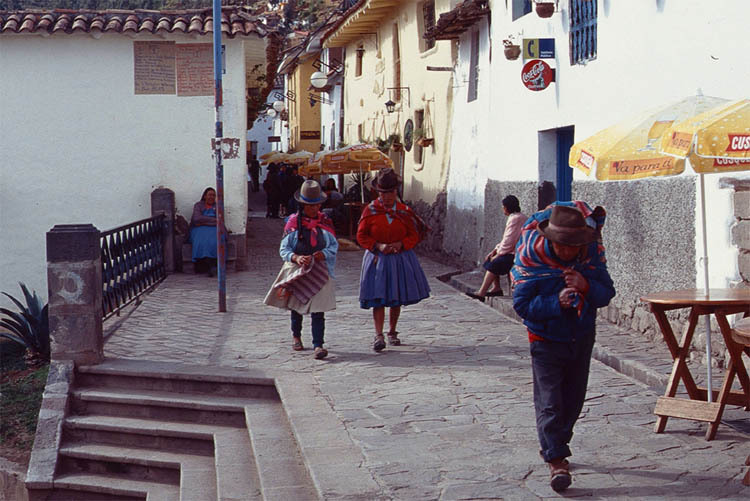 There are many airlines flying from Lima to Cuzco. I do not remember which one I took. Anyway, the flight was smooth with a clear view. 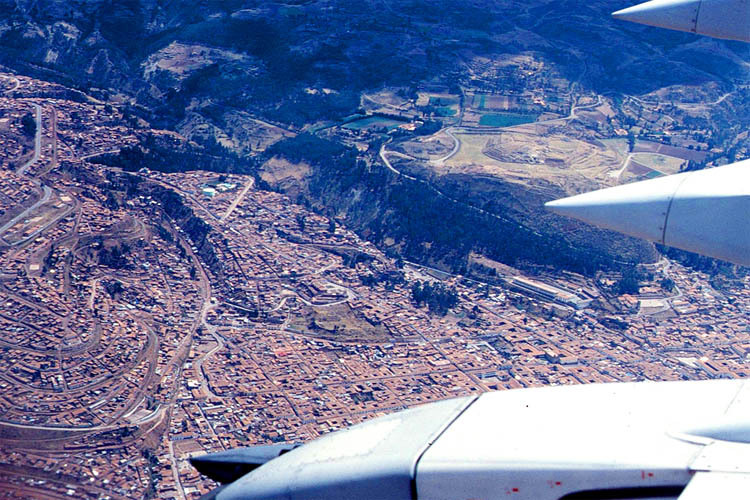 The plane has to fly low over Cuzco because the airport is only 4km from the city center. Once landed you will feel the altitude of 3430m already by getting out of breath if walking fast. What a good organized service. 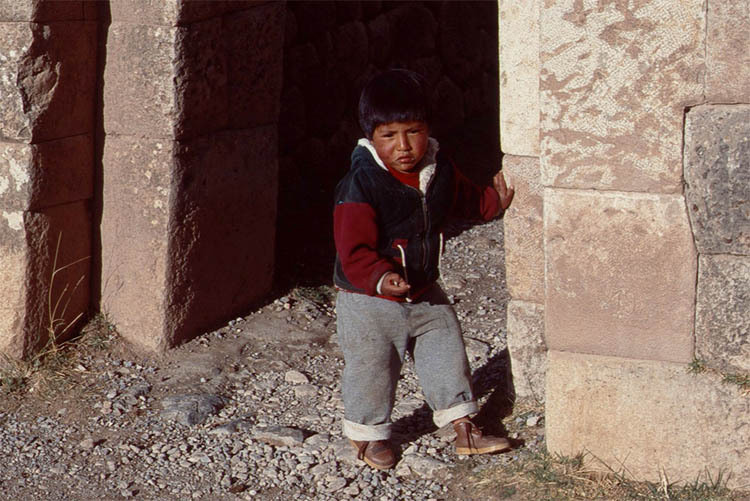 At the airport a guy was already waiting for me to bring me by taxi to my homestay in the southern part of Cuzco. There I was welcomed by the landlady who showed me to my room I was to stay for the next two weeks. I was advised to take one day rest to adjust to the altitude. I didn't. What the heck. I hope I will not get a heart attack. 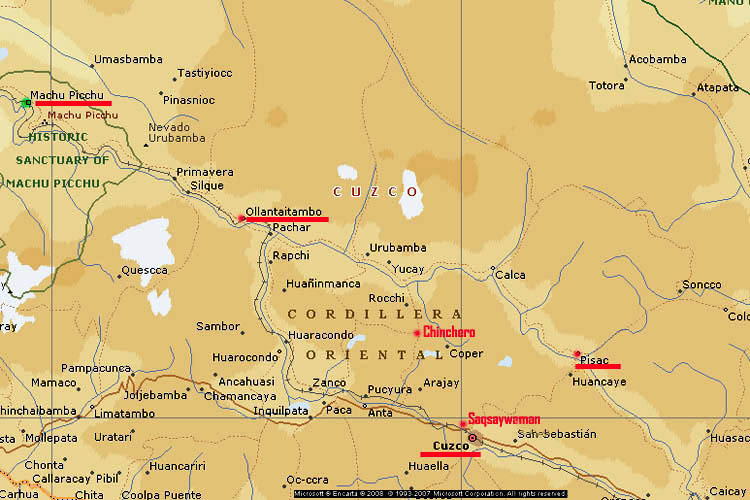 Since I was here not only to learn Spanish but to also see and experience as much as possible around Cuzco (look at red on the next map). 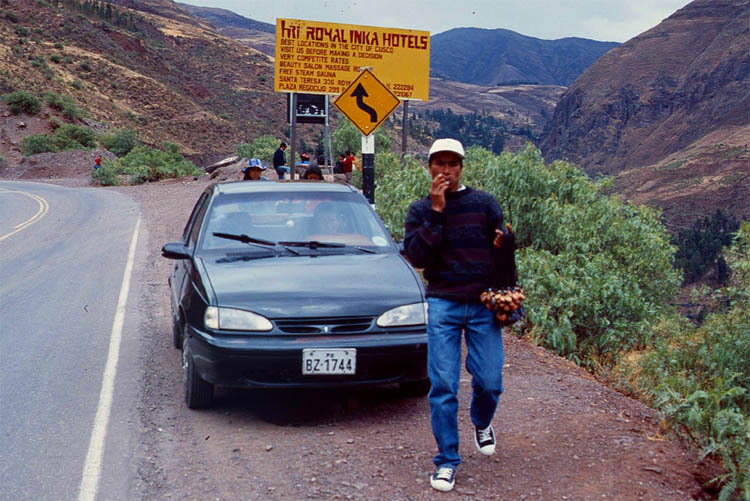 Next morning on a Sunday I walked to a terminal where buses were supposed to leave for Pisac. But no bus was there or already gone. So I looked around and a guy approached me and asked what I want. He was a guide and had a car and was available too. We negotiated a price of 7 USD (that I remembered) for a whole day sight-seeing tour. He really was a good guide and knew what I would like. 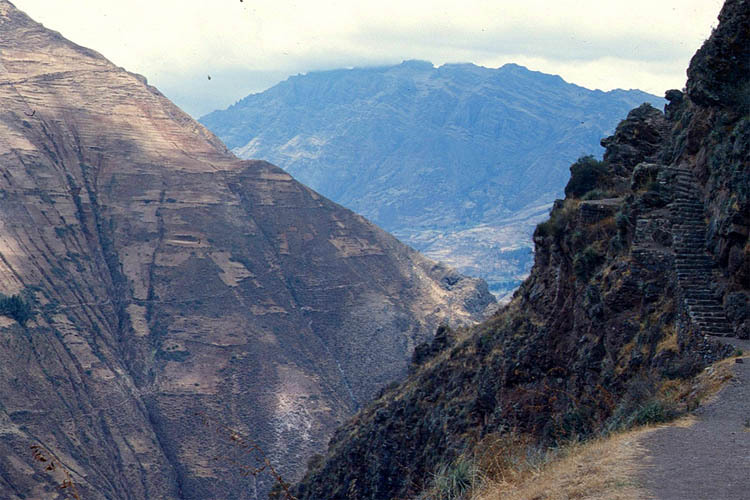 First we went and passed through Pisac and then halfway up a hill where he dropped me off. He told me to start walking along the trail to the ruins and then down to town where he will expect my back. 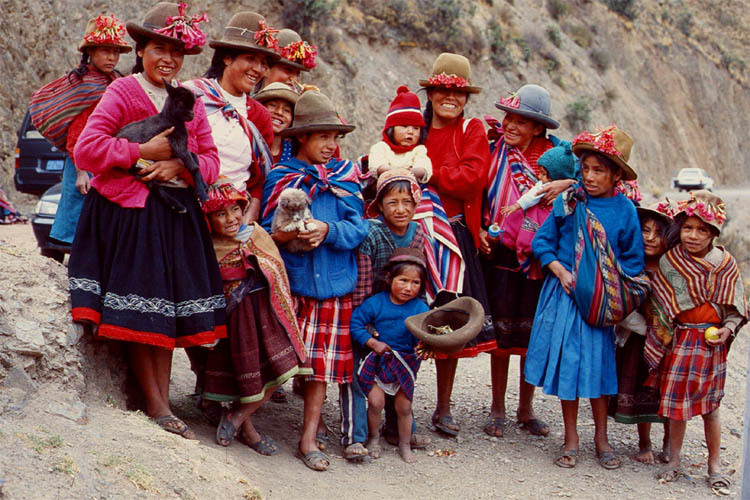 And this was already an Inca and tourist trail where I was greeted first by Inca descendants, a bunch of women with kids in their traditional costumes ready to be photographed for money. 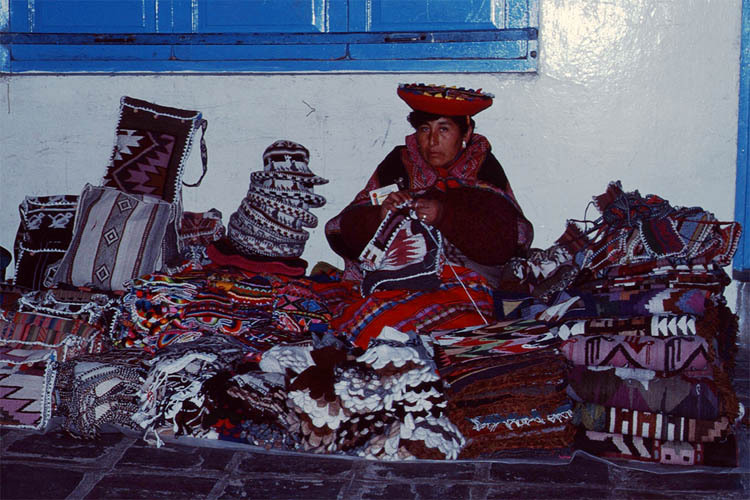 Then soon after that I encountered my first Inca construction. 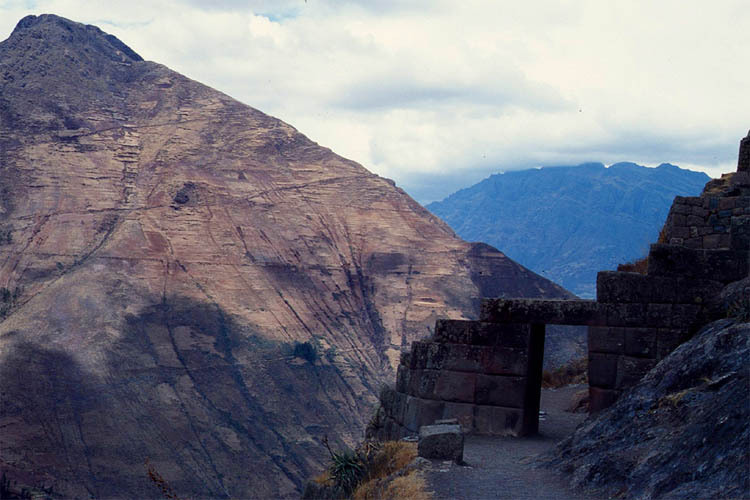 The trail I am walking was already part of the old Inca city Pisac. 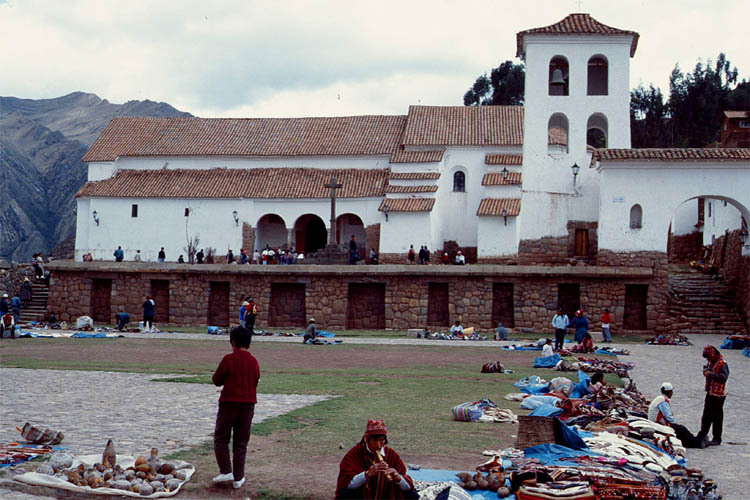 It even was one of the most important Inca places after Cuzco. But what's left? Soon I am overwhelmed when I reached the main complex. It must be the religious center, because the buildings were more accurate than the houses I saw before. Admire the walls with stones so exactly cut and piled up, that no razor blade can be moved in between. 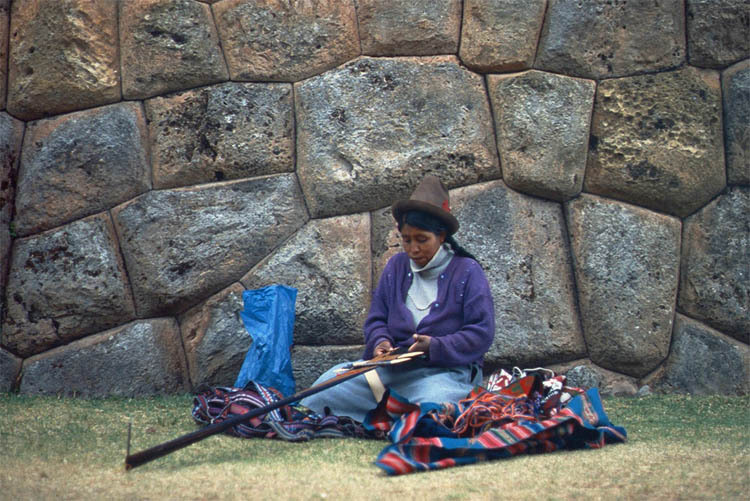 More will be described about the skills of the Incas later on. It also was a fortress 300m high up on the hill. 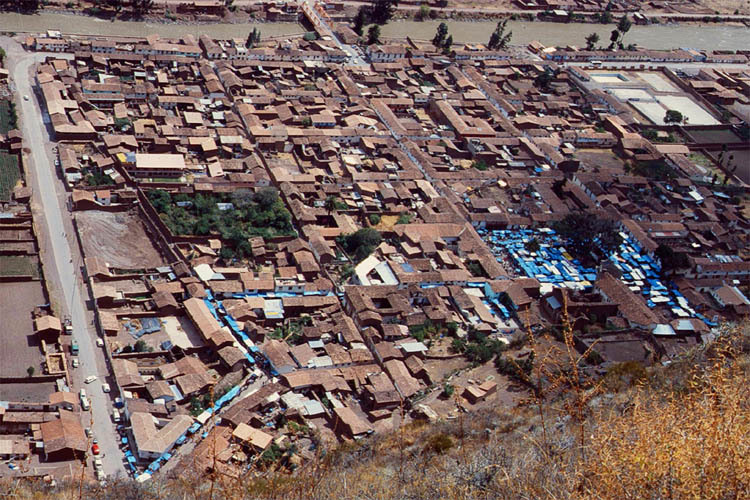 Any siege could have been withstood for a long time with wells and terraces to grow crops. What a nice place to settle down. And then the location, location, location. 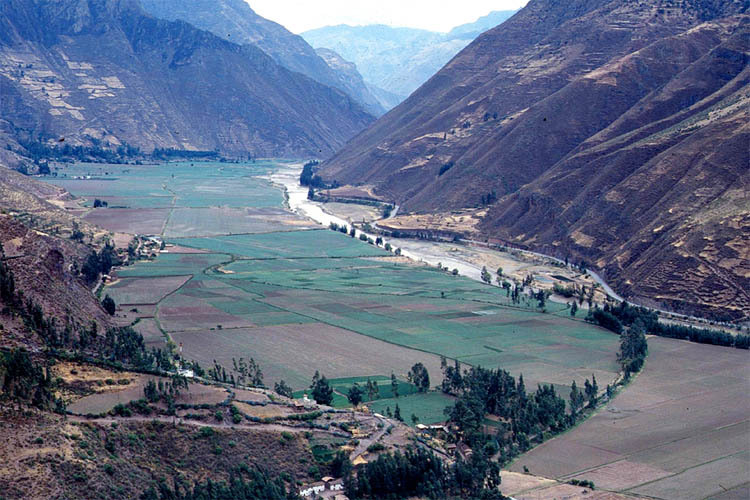 The view down into the valley of the Rio Vilcanota is really impressive. 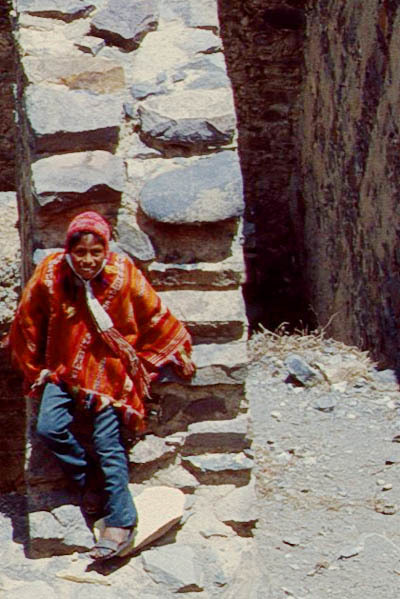 And now it's time to walk down to the new town of Pisac. 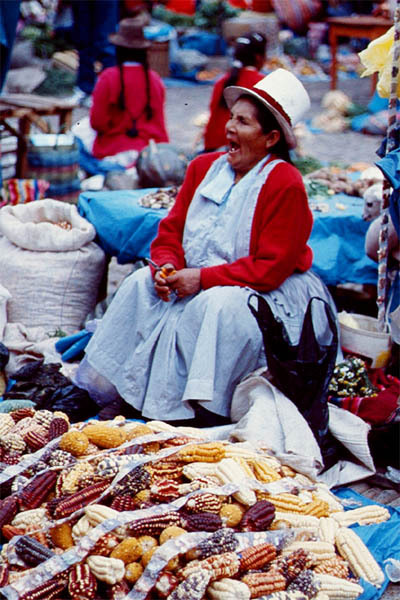 And on Sunday, like today, it is market day. You can't miss it, just head for the blue stalls. 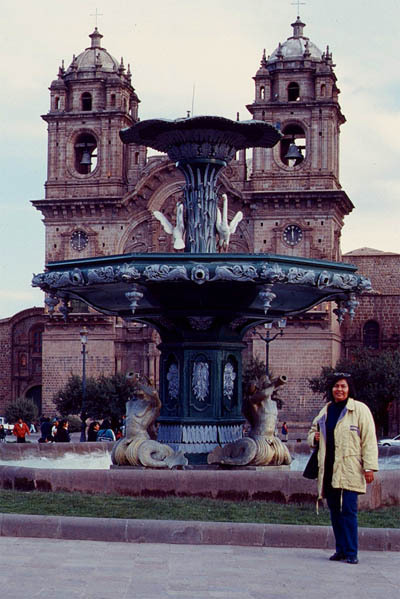 It's also right in the center at the Plaza Constitucion. Seeing all the veggies makes you hungry and it was lunchtime anyway. So where is the best restaurant according to the guidebook? 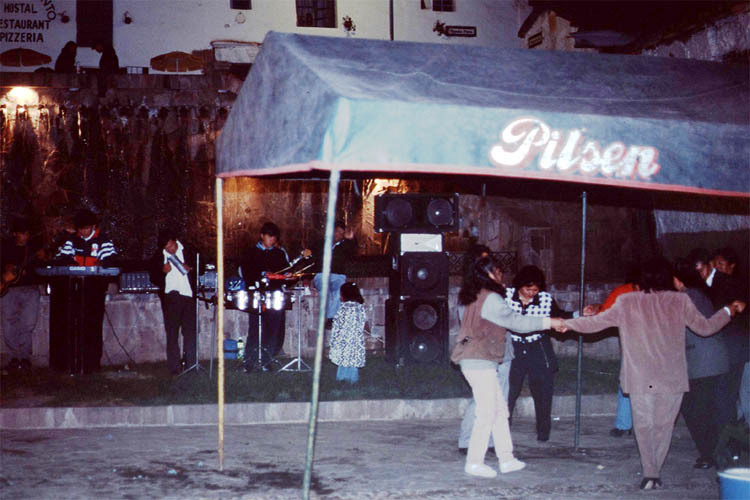 It's Samana Wasi Pisac, right in the middle at the Plaza Constitucion. There I had the famous trout dish while sitting in the court yard under trees and surrounded by flowers. 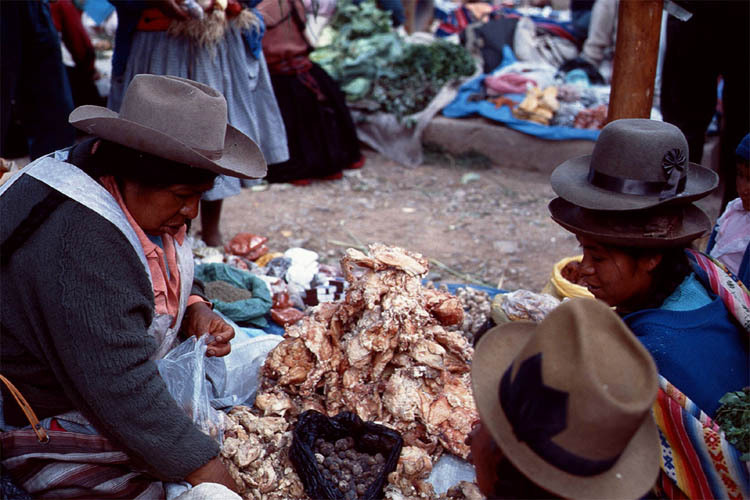 After that and saturated I strolled around the market and digest the trout and the many impressions. Come with me and take a look yourself. 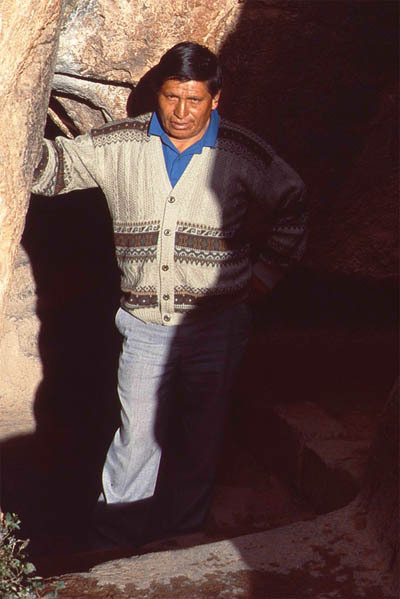 Is it the Alkaldes (mayor) of Pisac on the next photo or not? Parading in traditional outfit, especially the hat, which looks like a bowl, and carrying a scepter as an insignia of his authority. This is an old tradition because this town also has a long history. 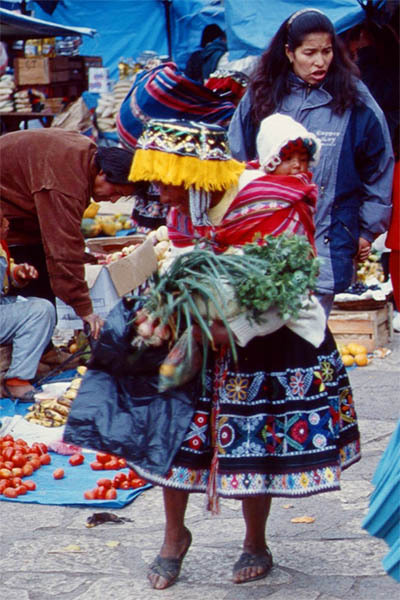 The riches of the veggies Inca gold treasures? Finally, I was ready to leave this interesting location. My driver was already waiting for me at an intersection (as he explained to me before). He didn't complain that I was a little bit late. 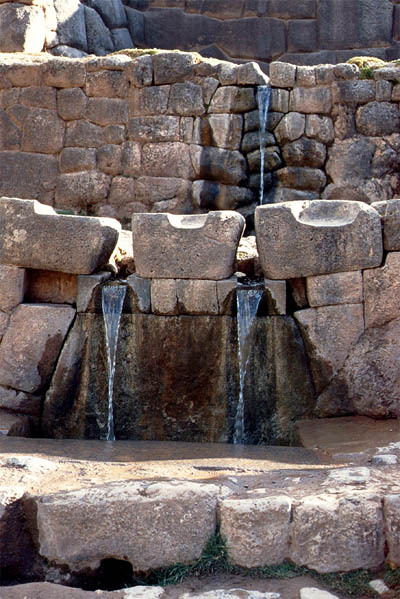 Instead of heading straight back to Cuzco, he showed me more places, like the "Bath of the Inca". That's the way as it is called now. 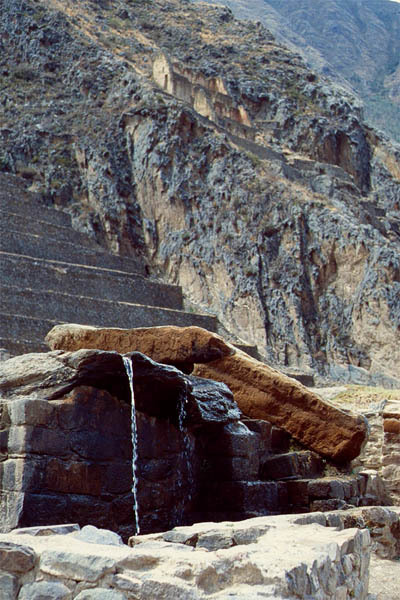 Whether it was really a bath for tired Inca runners or a Roman thermae for the nobles or just a sacred water shrine for religious ceremonies. Nobody knows. 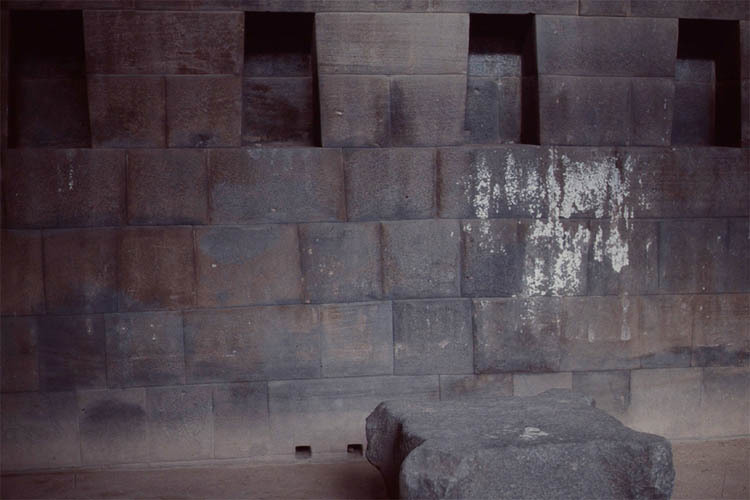 There is no pictograph carved in stone. And no knots to be deciphered either. Only one thing is for sure: water is still running from an underground source. Now we really hit some sacred place. It must be, because what else can it be used for than for ceremonies. But everything else is still open for interpretations. Is it that the blood of sacrificed human beings are spilled into the serpent like channels which even lead then into the caves and further down into the underground, or underworld, or Hades. 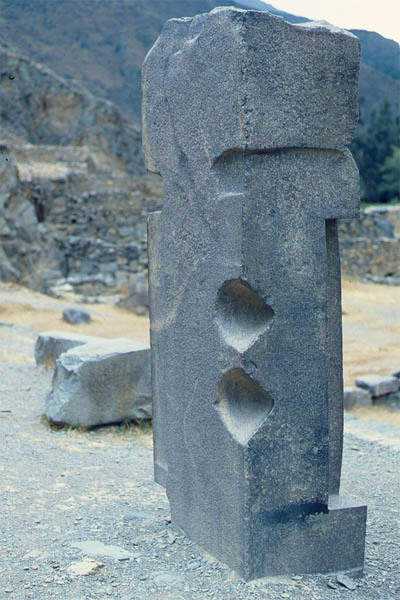 There are other sculptures partially destroyed supposedly by the Spaniards. 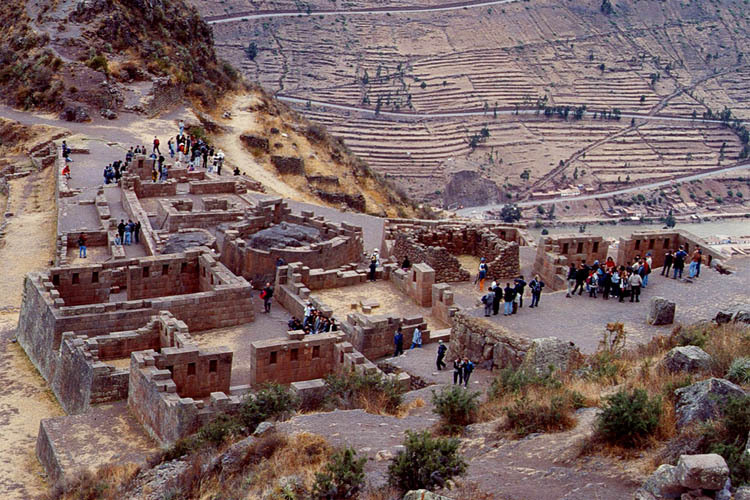 They had been doing this with all the other places thought to be sacred by the Incas. 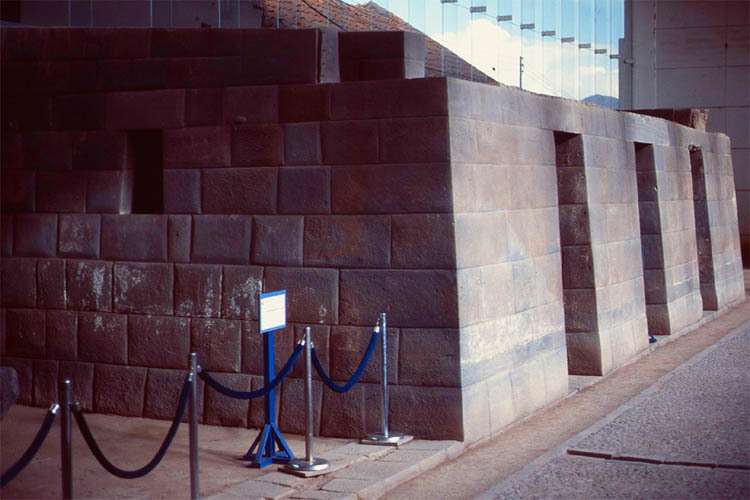 This may be then proof that this was also an Inca sacred place which must be eradicated. 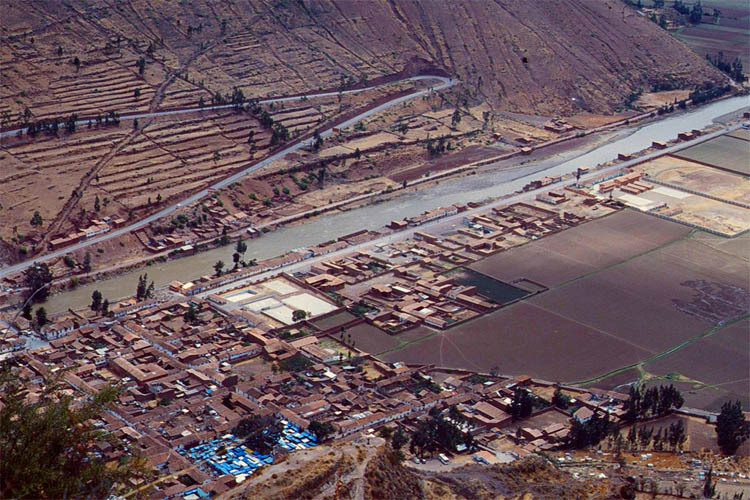 By the way, this place is still called "Qenqo", which in Quechua, the official language of the Inca, means serpent. Actually not much to learn from that: It is pretty obvious. 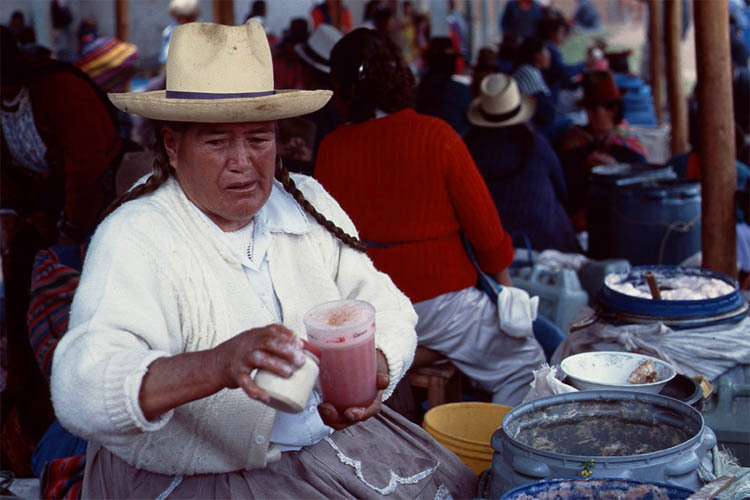 But if the name would be "Bloody (in Quechua) Qenqo", then maybe you could get a better idea. 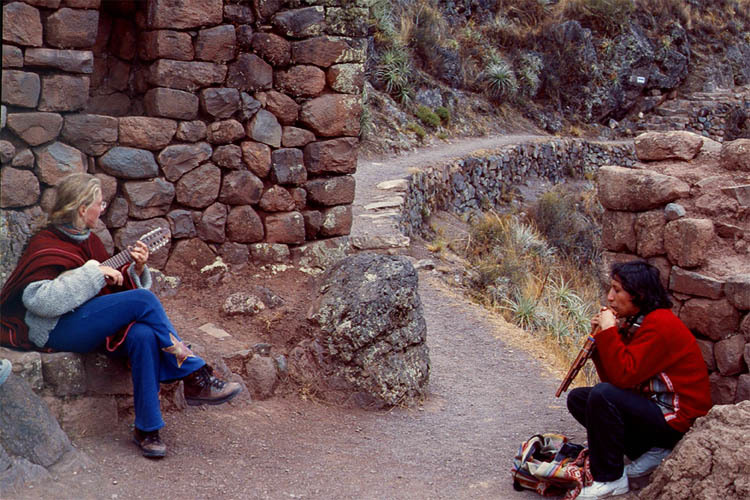 Back in Cuzco. Monday morning. After breakfast, my landlady accompanied me to school. That was her obligation as a homestay host , but only on the first day, so that I will not get lost and know how to get there the following days. 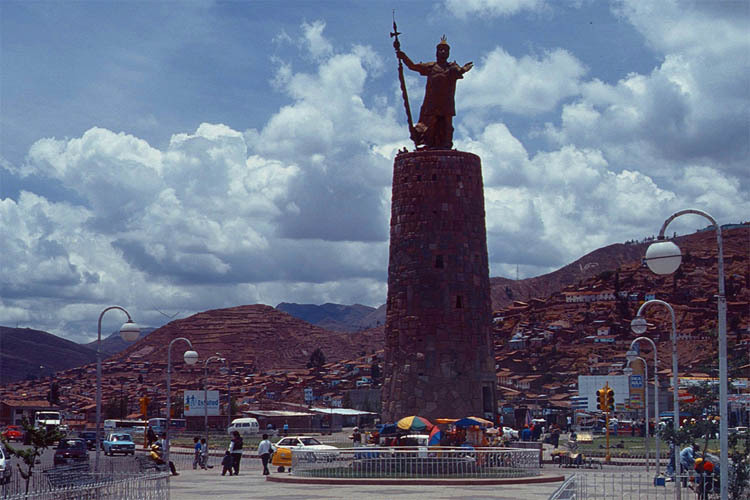 Every day I passed the monument of Pachacutec. 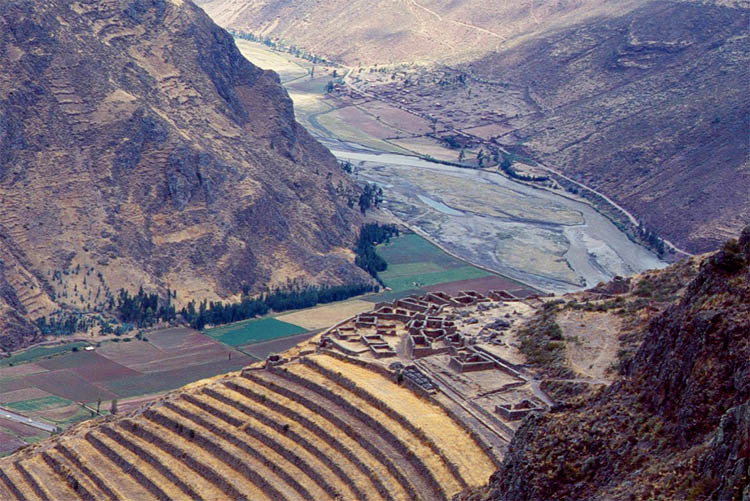 He was the 9th Inca ruler who made Cuzco the capital of his whole Inca empire. 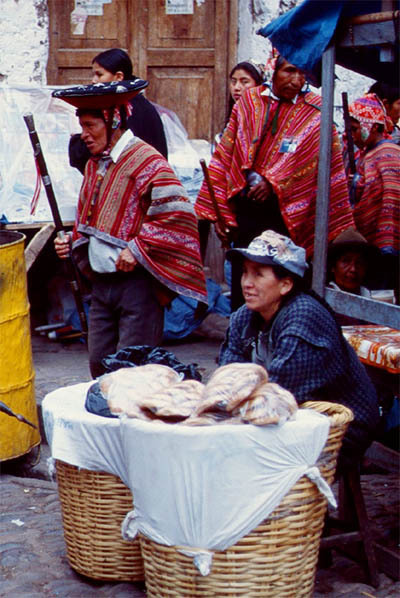 The heydays lasted from 1438 until Atahualpa, the 12th Inca, was captured and subsequently killed by Pizzaro in the year 1533. 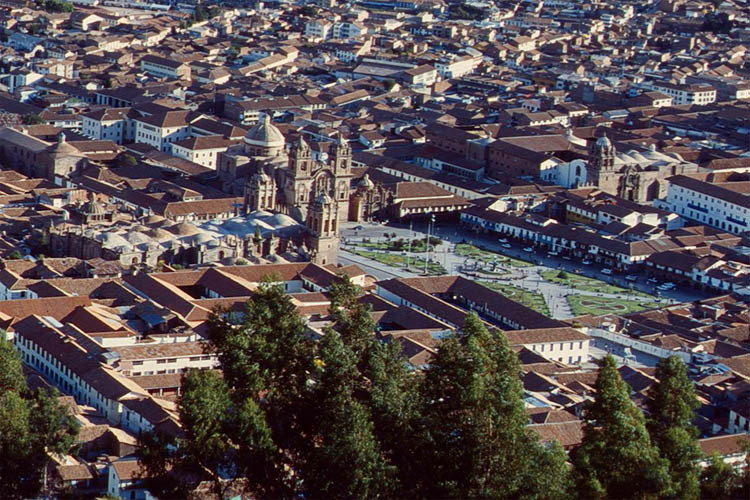 The same year the Spaniards marched into Cuzco without any fight. 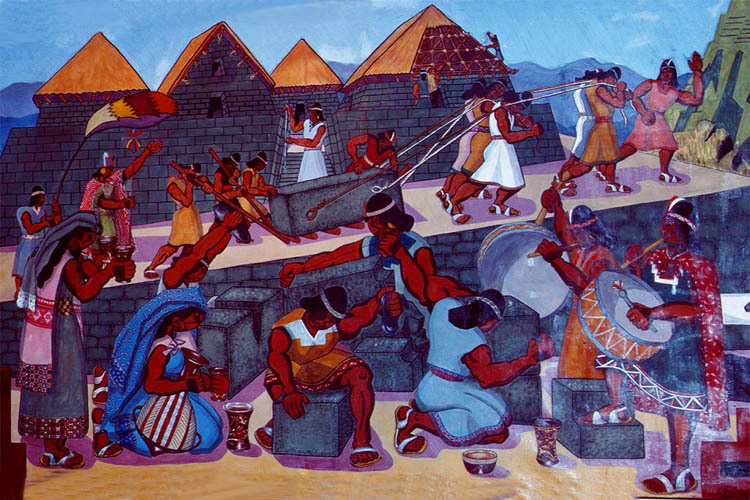 After they stole all the gold and silver they tried to destroy all the temples and palaces. 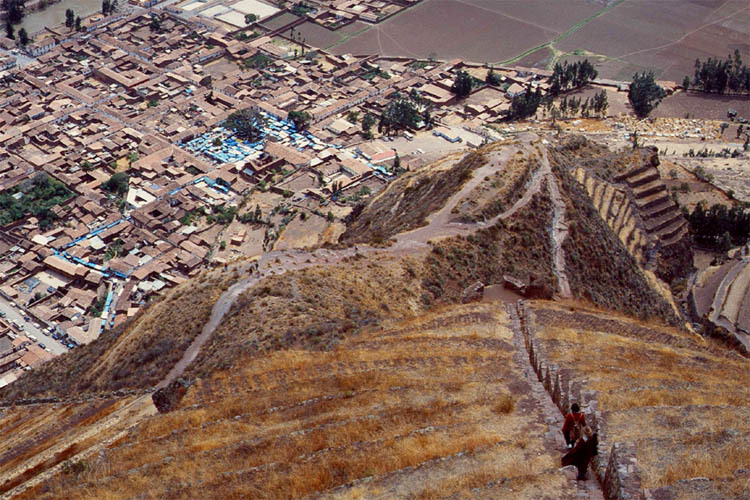 Since this turned out to be impossible, they constructed their own churches and palaces on top of the Inca buildings. One of the churches was Santo Domingo (which I also passed almost every day). 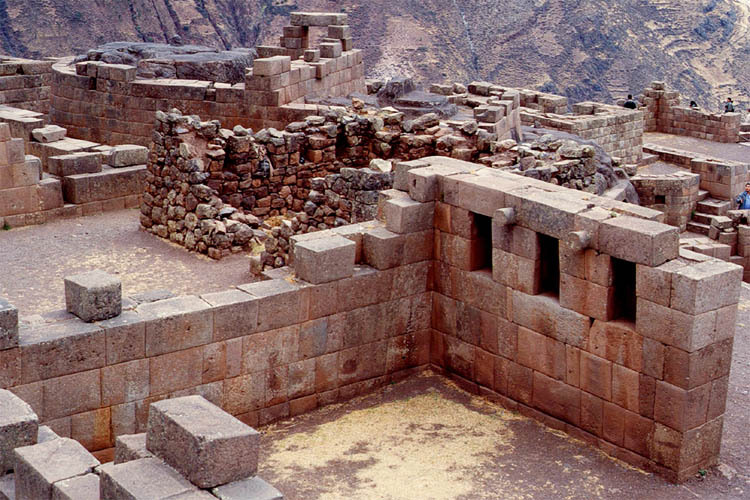 After an earthquake in 1950 this church was almost destroyed but unearthed the old Inca sun temple Qoricancha. More about that later on. And then I reached my school, called ACUPARI, which is part of the German Consulate, or vise versa. Look up the internet to learn more about it. 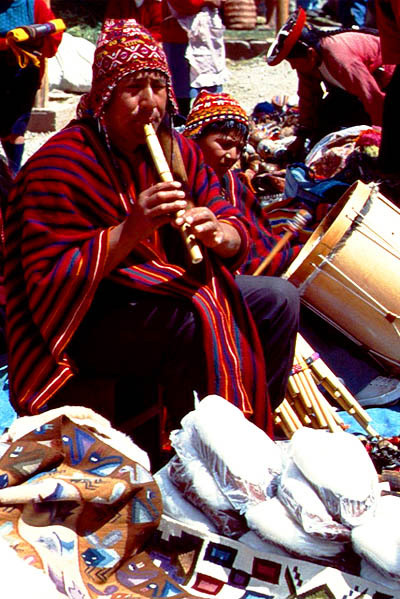 I have already learned a lot, not only Spanish and Peruvian culture but also what a Consulate is doing. One case was that two German girls disappeared in the Peruvian Amazon jungle. 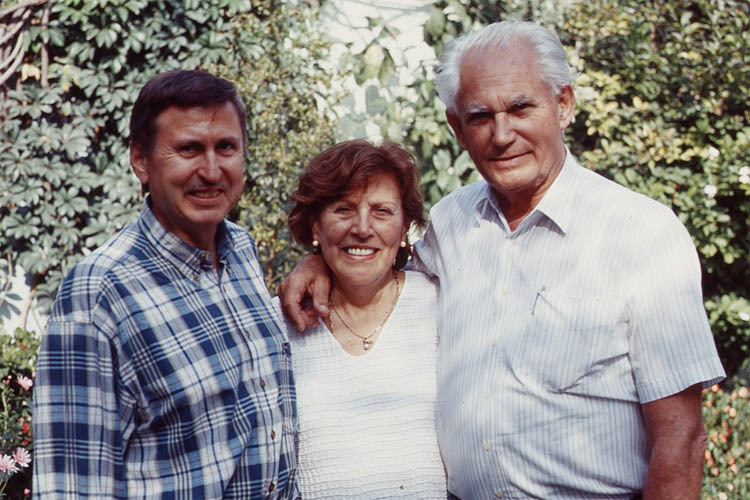 Frau Consul had to coordinate search teams and take care of one of the fathers who came over from Germany. The girls were never found, though. Back to school. 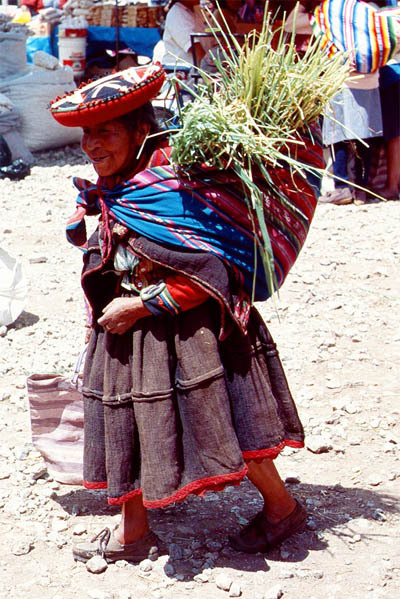 My private teacher was a very nice lady from Cuzco, who taught me Spanish 8 hours a day. 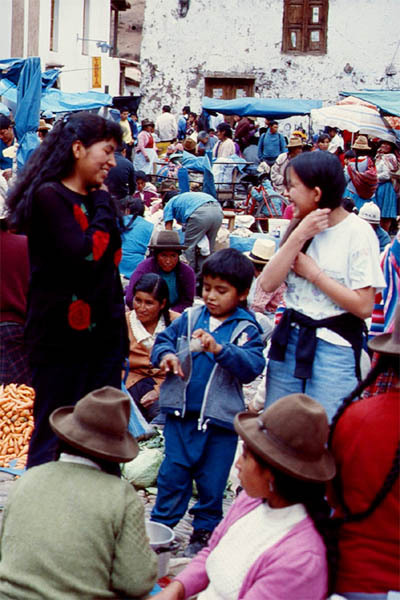 Then another local lady was assigned to me as some kind of tutor to practice more Spanish in the late afternoon during some sight-seeing or while going to a museum or café. 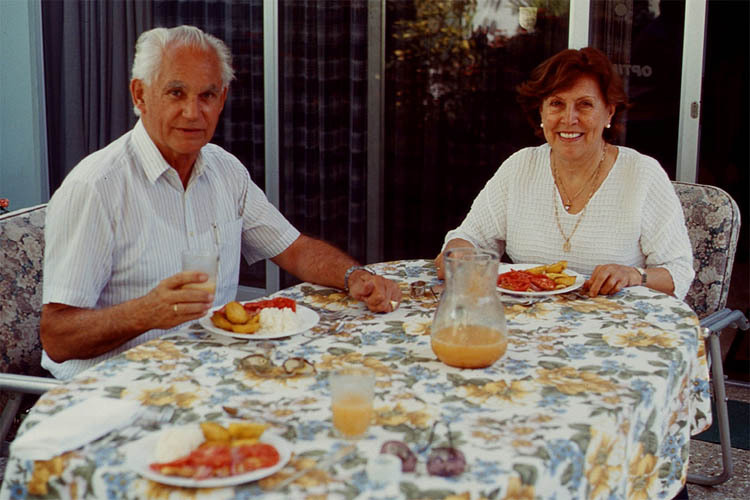 After that I had some Spanish conversation with my landlady at dinner time. After that I had to do some homework. 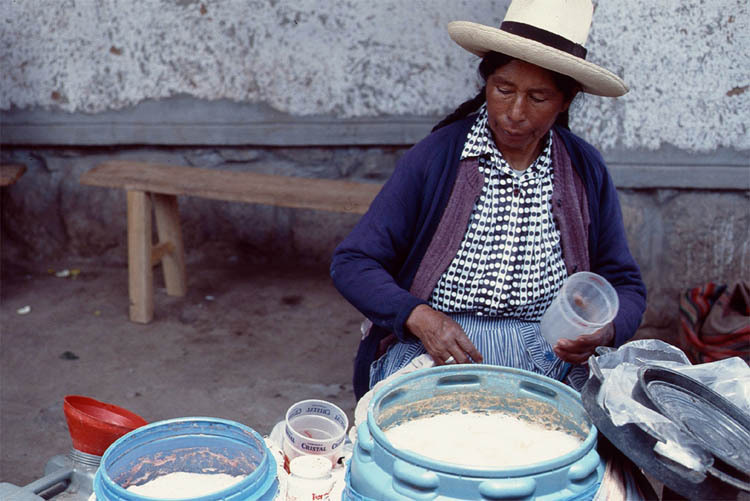 Next morning started again with small talk in Spanish at the breakfast table. 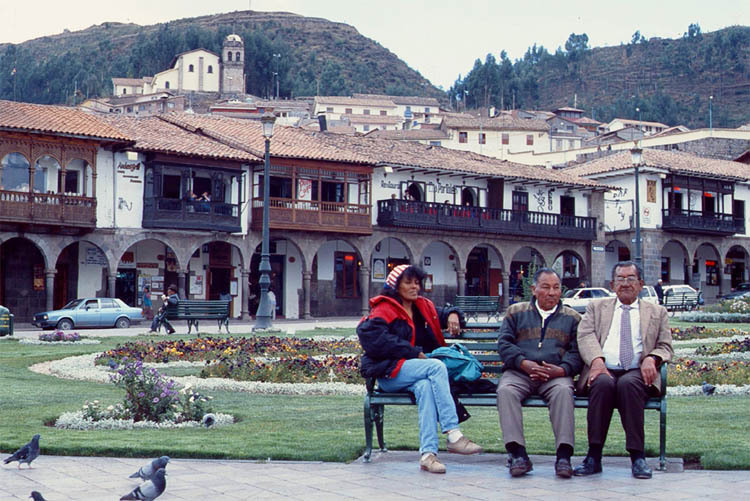 Forget how to learn Spanish for now and take a look at the following pictures to get an idea of the heritage of the Incas and the Spanish conquistadores, and of course contemporary Peruvian life. 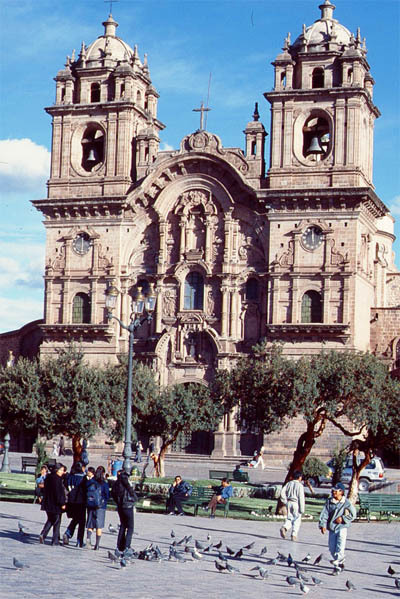 The impressive Iglesia La Compania is the focal point at the Plaza de Armas. 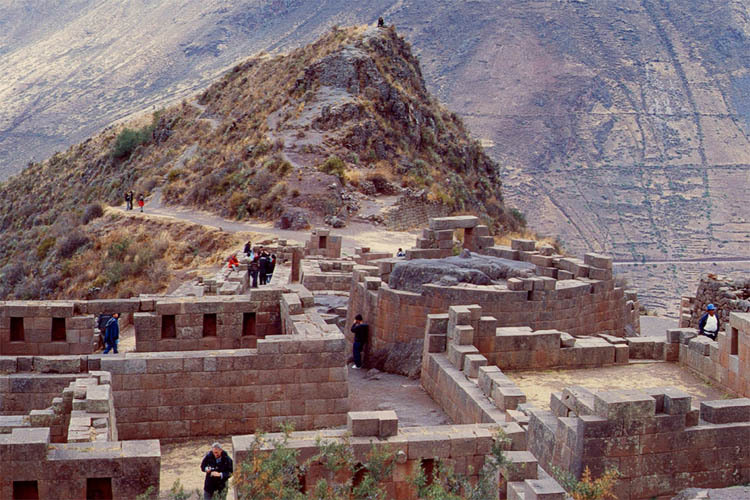 It has also been built on top of an old Inca temple and palace. 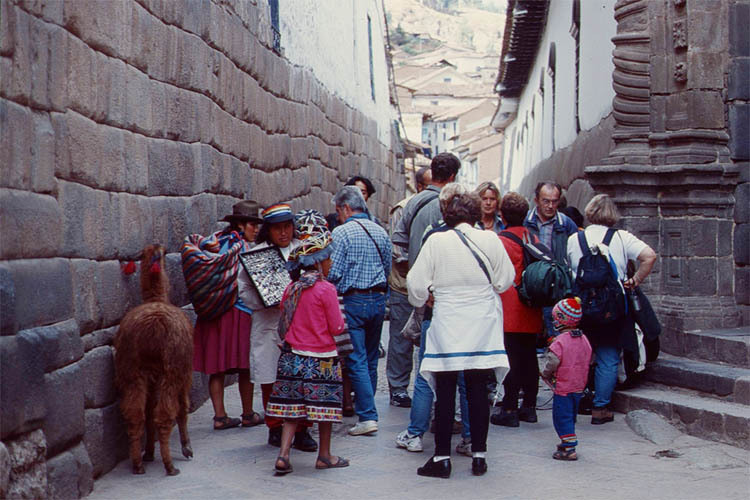 Tourists are more interested in Inca structures than in old Spanish churches. 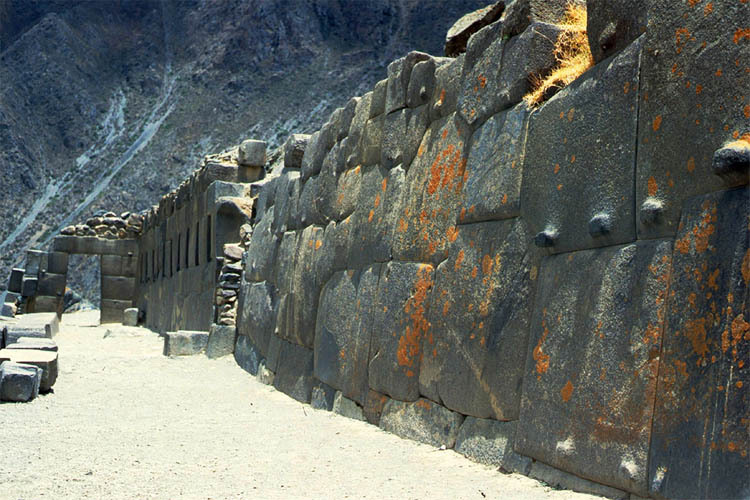 And the governments of Peru should be happy that the Spaniards could not destroy or hide everything the Incas built, like the big wall. 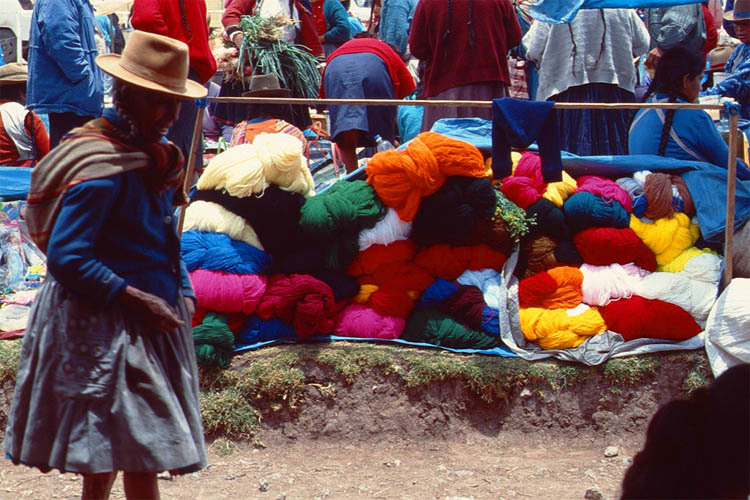 Without the tourist dollars Peru would be much poorer. 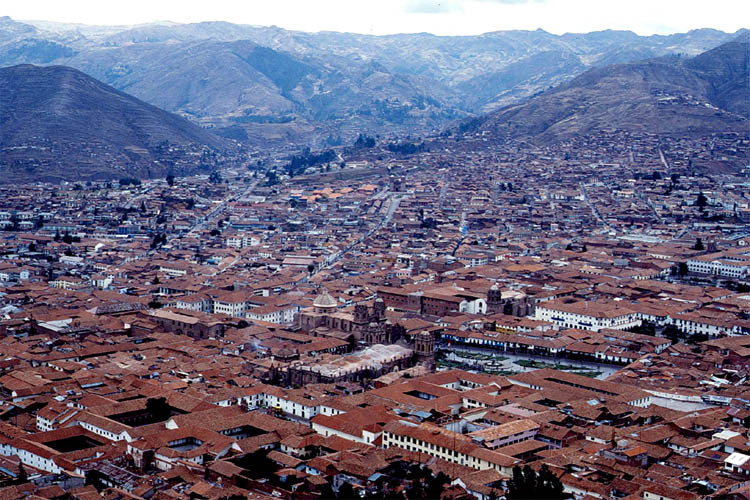 And Cuzco would be much richer if the central government in Lima would give more of the taxes earned in Cuzco back to the people of Cuzco. 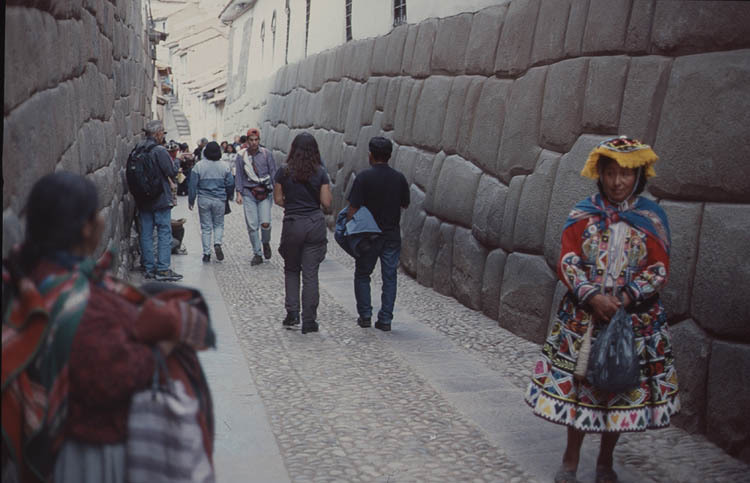 It's unbelievable how the Incas could have cut the stones to fit together and with such a precision, even if some of the rocks have up to twelve corners and each stone is different in weight and shape. 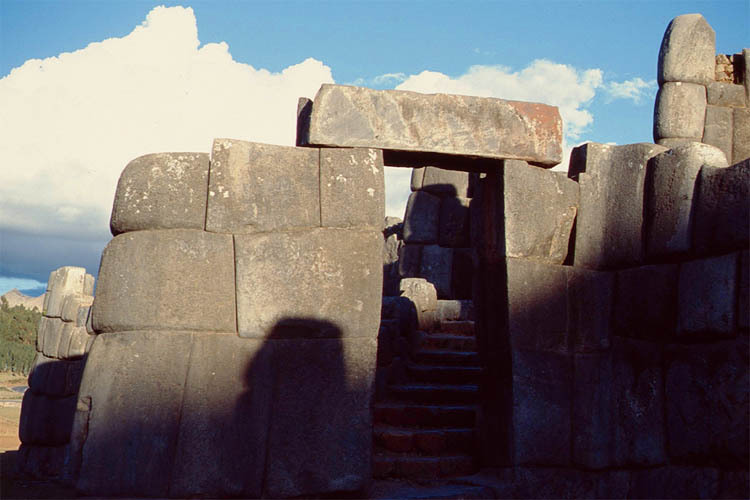 Maybe this interlocked stone structure was more the reason that it withstood all earthquakes. Walls built with same size stones would have definitely not been that robust, and the walls built with bricks and mortar even less so. How could they cut the stone so exact Was that the way how they did it? 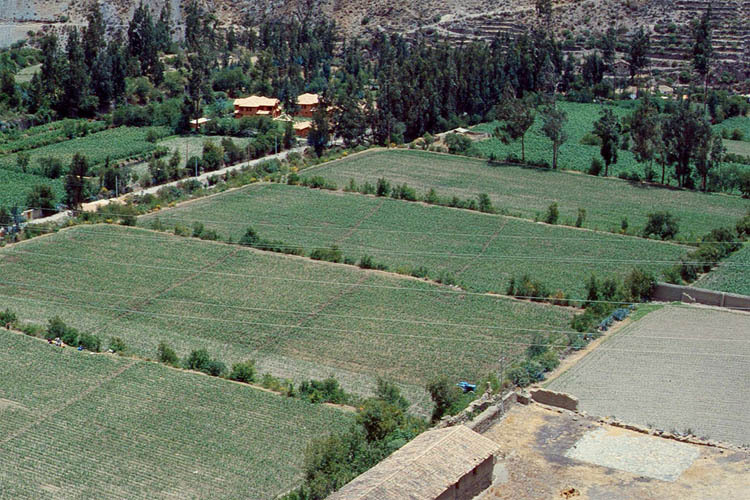 Thus the Spanish churches may crumble in the next centuries but the Inca walls will still stand the next millennium. 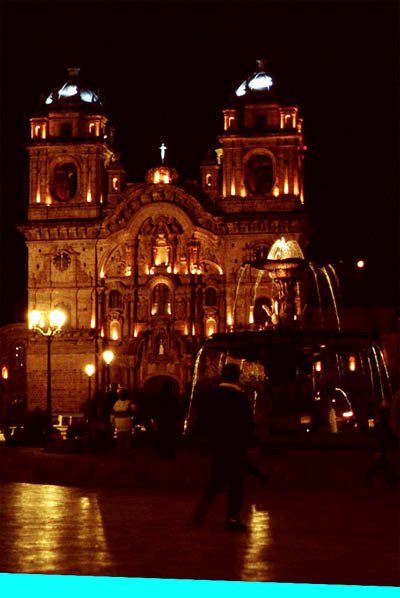 The churches still look nice, though, especially the illuminated Iglesia La Compania in the evening. 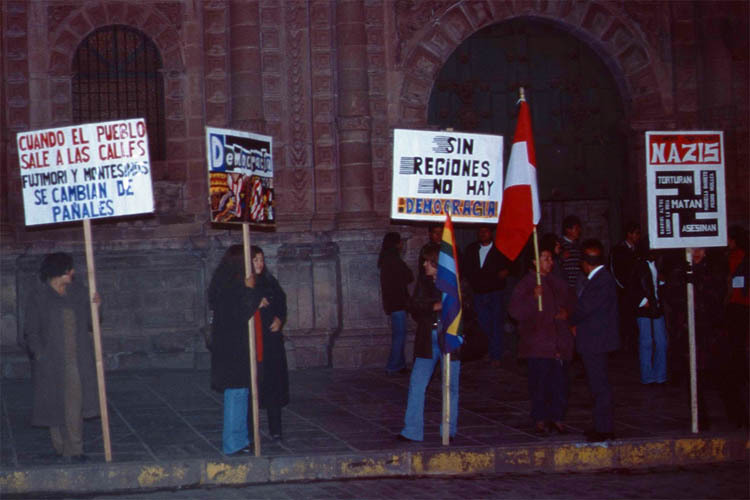 But this does not look so nice: A demonstration just in front of the university, next to the Iglesia La Compania. And what do they want: more democracy, of course, especially for the regions. 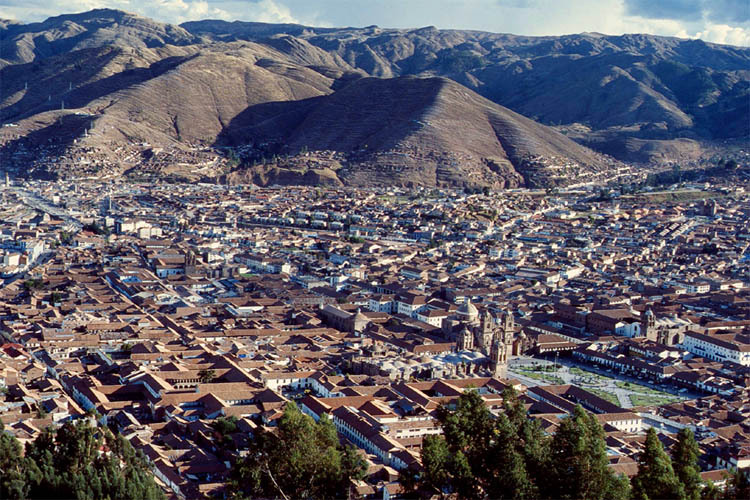 The Cuzco region wants more say, as I said before. Then there is also opposition against the incumbent president Fujimory and a call for new election. Also accusation of torture, killings and murder are on the agenda. Do you know anything about the story of the corrupted chief of intelligence Montesinos or the Shining Path guerrillas or the Tupac Amaru rebels? No? Then read more about it in the internet. 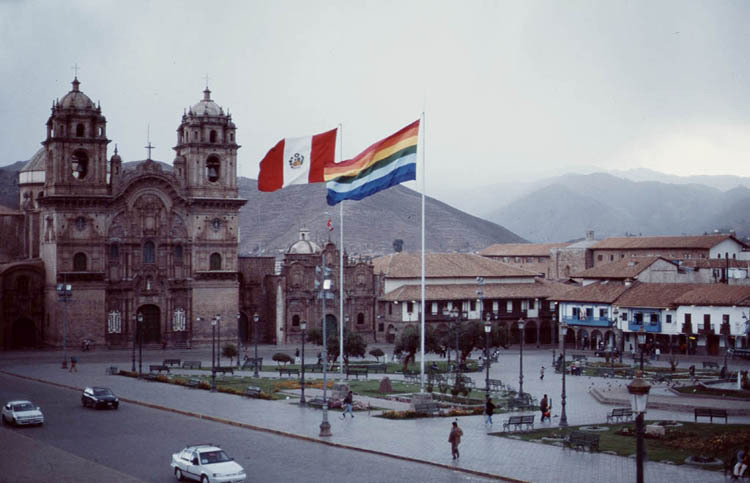 Ok, I still felt safe in Peru, especially in Cuzco city and the province. I think it still was the best time when I was there. 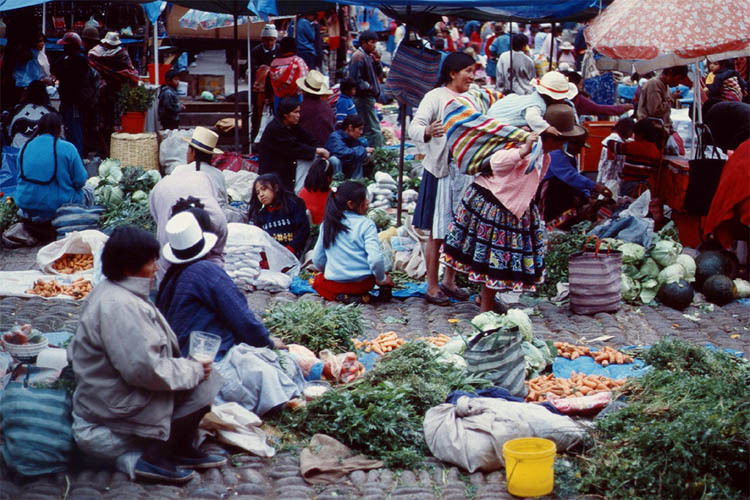 And also live goes on as usually: People are dancing in the streets and the night market is lively as ever. Another weekend, another excursion. 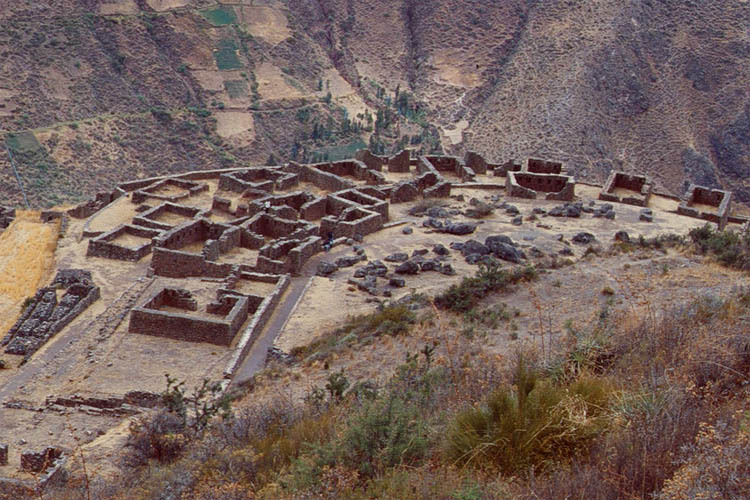 This time visiting the impressive temple and fortress complex of Ollantaytambo just beside the town of Ollanta, or better: above Ollanta. 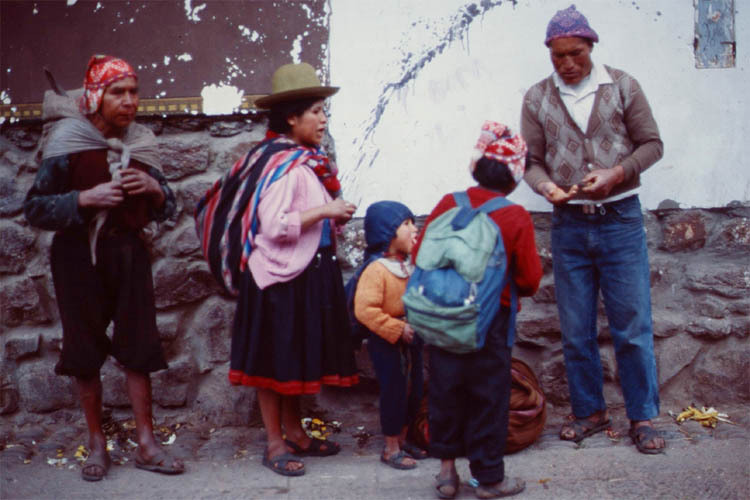 The minibus, called colectivo, took around one and a half hour to get from Cuzco to Ollanta, which is the oldest still populated town in South America. 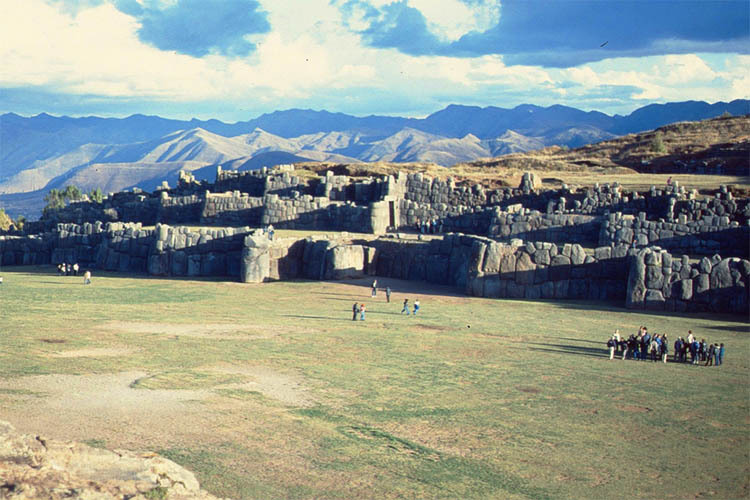 The fortress itself was started by the Inca Pachacutec in the year 1460 but could not be completed before the Spanish beleagered it in the year 1536 though without being able to conquer it. You will know why if you look at this rock-solid construction and the preferred location up the hill on the following pictures. 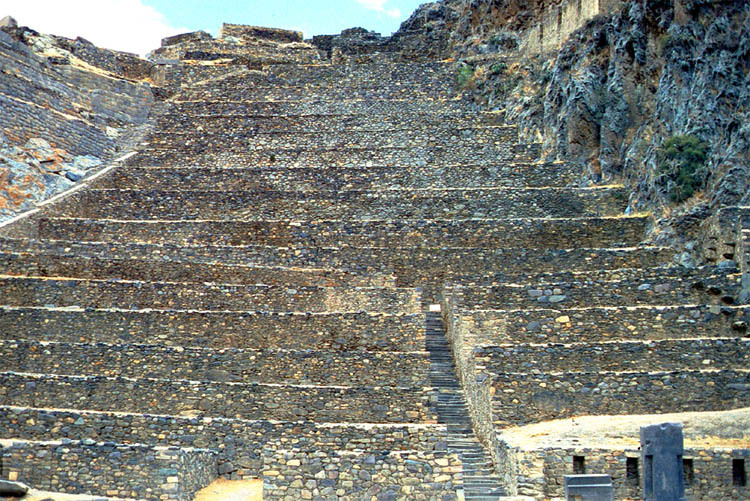 The terraces of Ollantaytambo How to walk up? 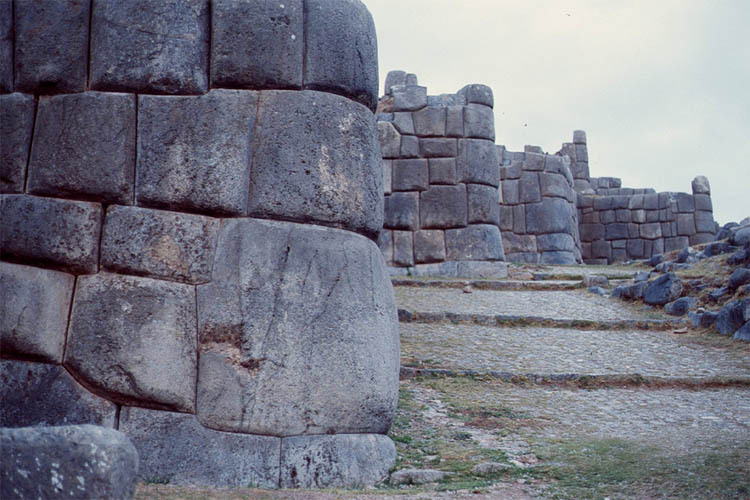 Then I encountered a wall, almost 4m high, consisting of six big megaliths, weighing each up to 50 tons. 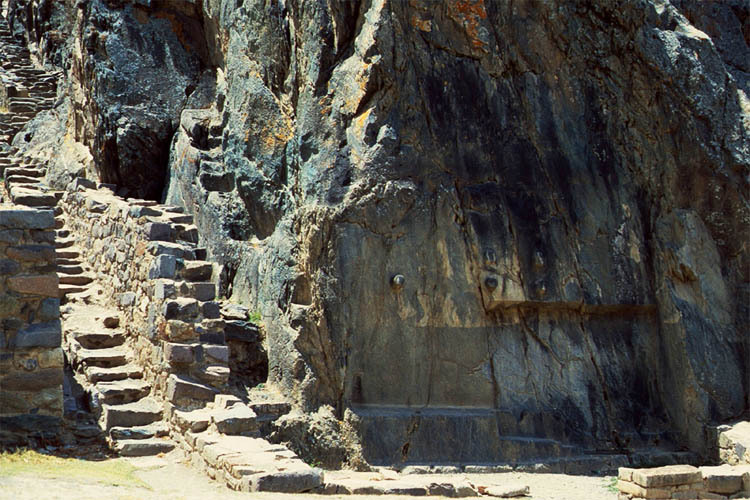 How could the Incas have transported and cut such big rocks without using wheels and pulleys? Ok, they worked very hard for the gods, because this is supposed to be part of the temple. The houses for the people are much simpler and easier to build. 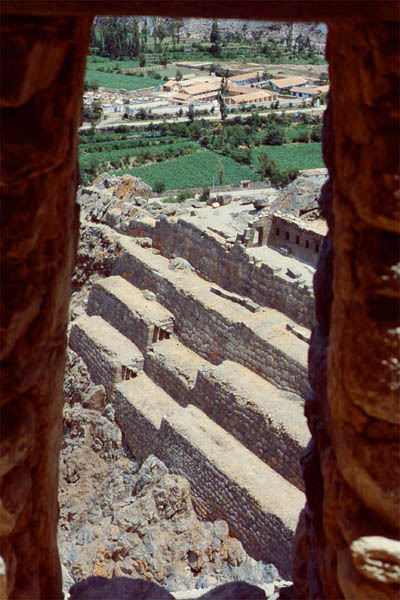 After walking down another staircase while leaving the protective fortress walls I reached a field which looked like a thermae, i.e. 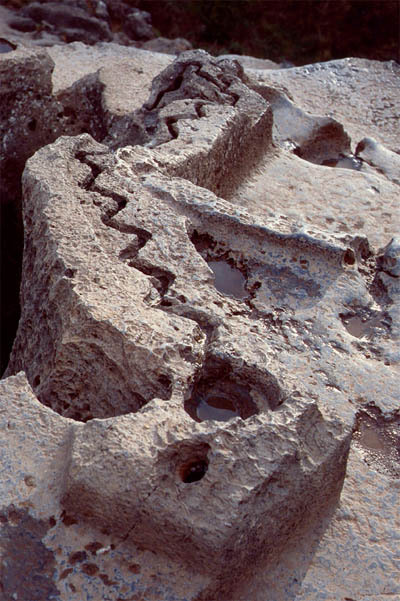 a bath system, from the Romans. 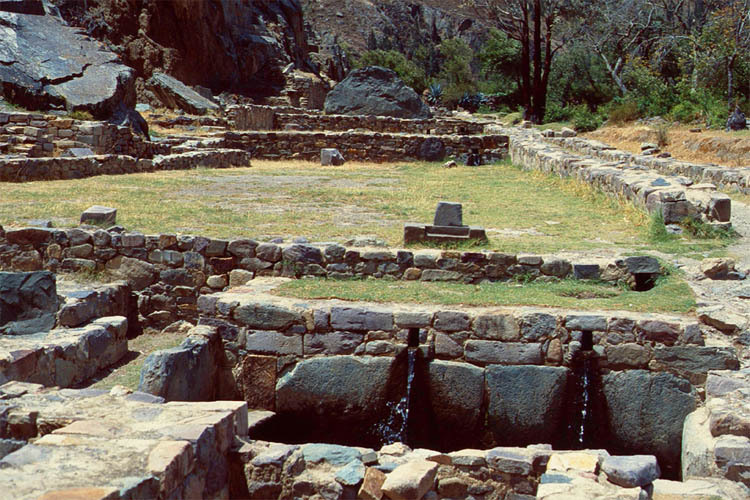 This place is also called "Baño de la Ñusta", which means "Bath of the Princess", but it was not a water spa for the royals but a holy spring to worship the water god to bring fertility to the crops in the fields, according to the guidebook. Maybe true, maybe not. I can imagine that men and women were taking a bath together while performing all kinds of fertility rites. How about that? I have read and heard many explanations also about many other sites but they are all assumptions because there is no written tradition. 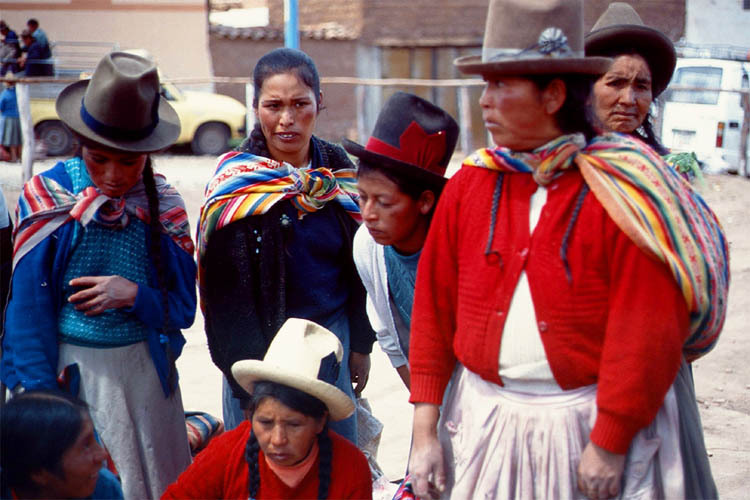 However, there is one story oral passed from generation to generation, the drama of Ollanta. It's some kind of Romeo and Julia but with a happy ending. A booklet of that story I received as a farewell present from my Spanish teacher. 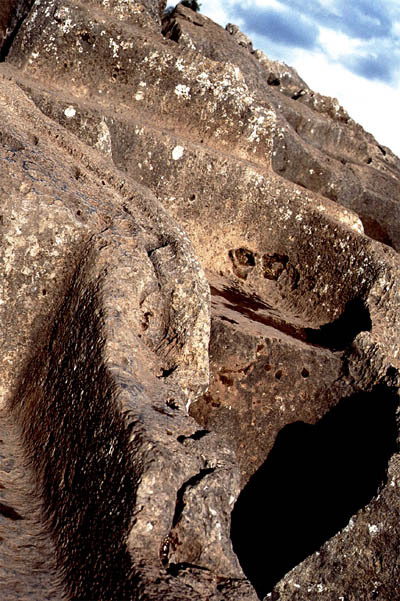 The following nicely carved and polished stone is supposed to be an operating table for trepanations, i.e. open skull surgery. I don't know who did get that idea but it seemed to be a common assumption. I wonder, though, how the stone must have stood and the patient lied down and the head adjusted. And why two indentions (for a brain transplant?). 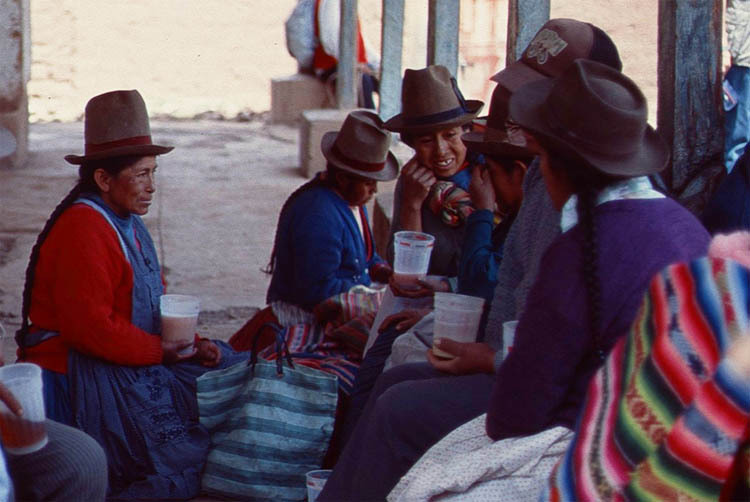 One thing is for sure: there have been trepanned skulls found in Peru. 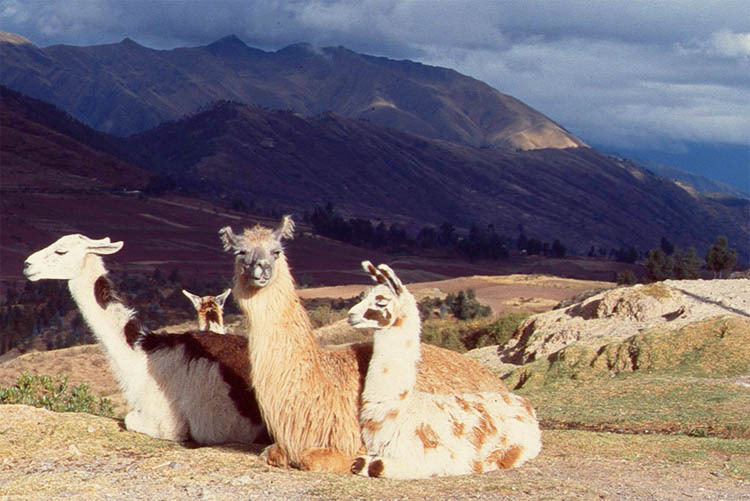 Back to Cuzco. 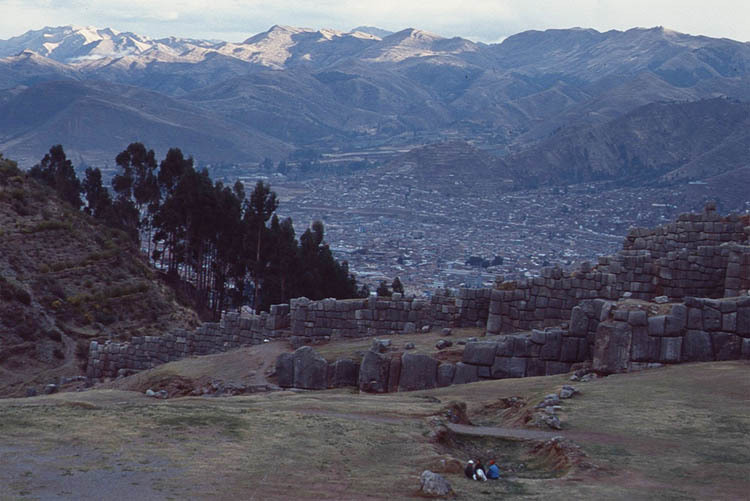 Or better: Saqsaywaman, just up the hill overlooking Cuzco. And this is the most colossal fortress I have ever seen. 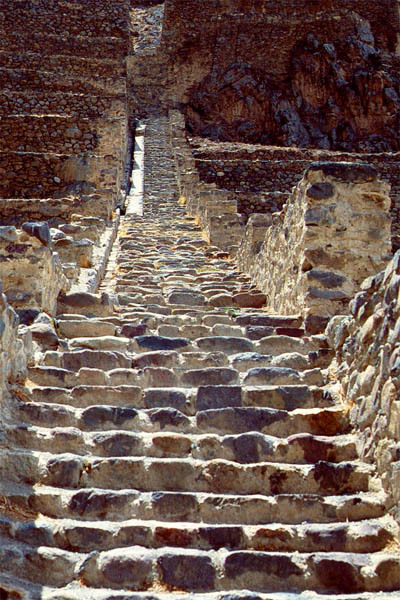 It is estimated that it took up to 40,000 people and 70 years to build. 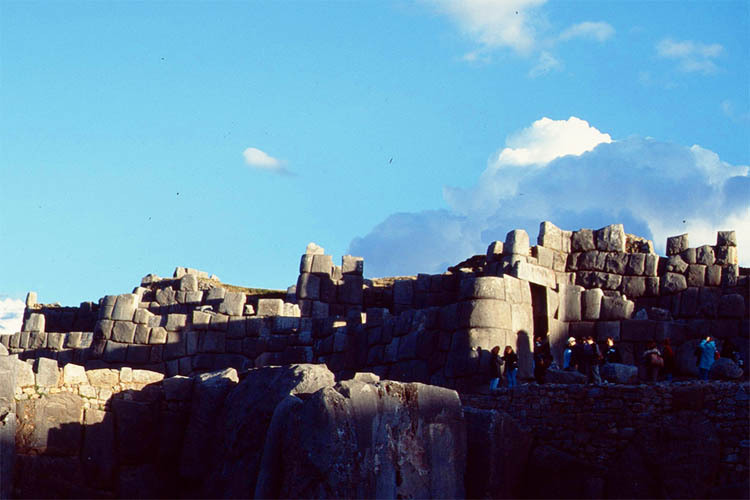 But it still looks as only Cyclops could have erected the stones, the biggest one with measurements of 9x4x5 meters and weighing 350 tons. 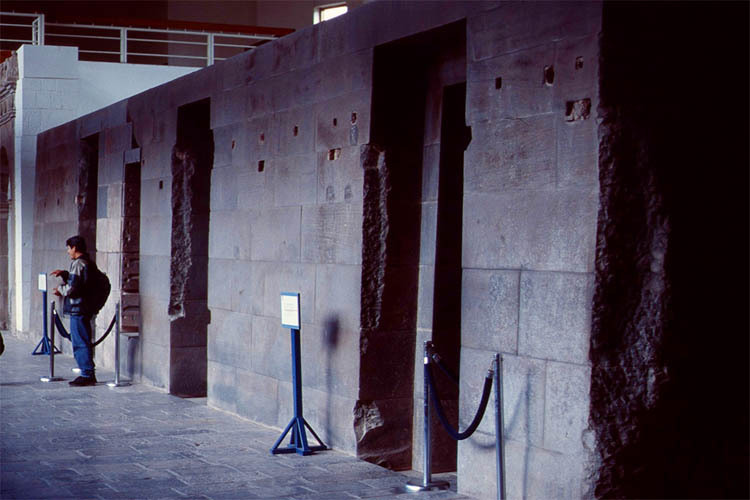 The outer of the three walls is 600m long and 9 meters high packed with rocks so tight that no razor blade fits in between the joints. 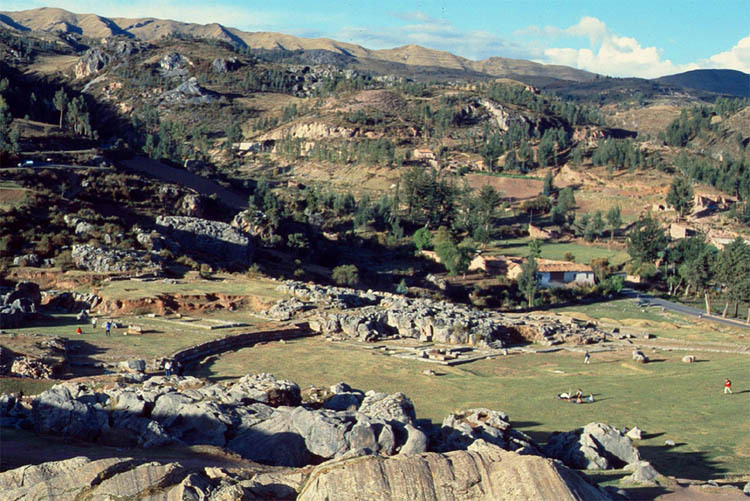 Saqsaywaman was just finished before the Spaniards came, but it didn't help the Incas much to withstand the conquest of Cuzco in 1533. 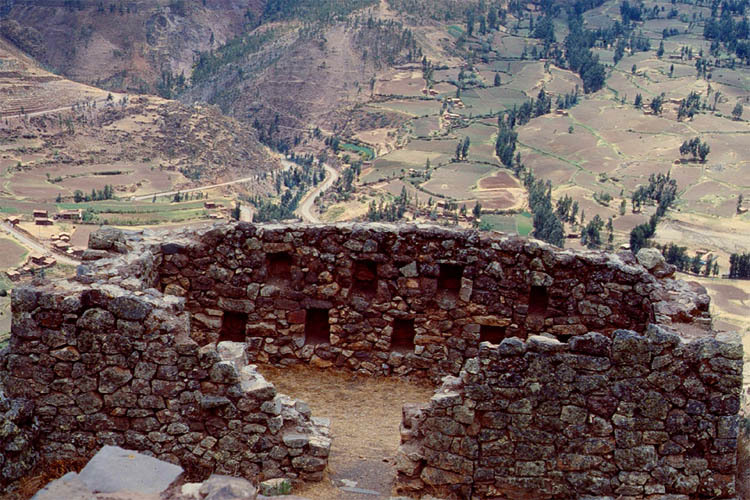 Only 6 years later the Inca Manco, the brother of Atahualpa, staged an uprising against the Spaniards and beleaguered Cuzco and occupied the fortress again, but could not keep it for long. If you want to know more then just look up history books. 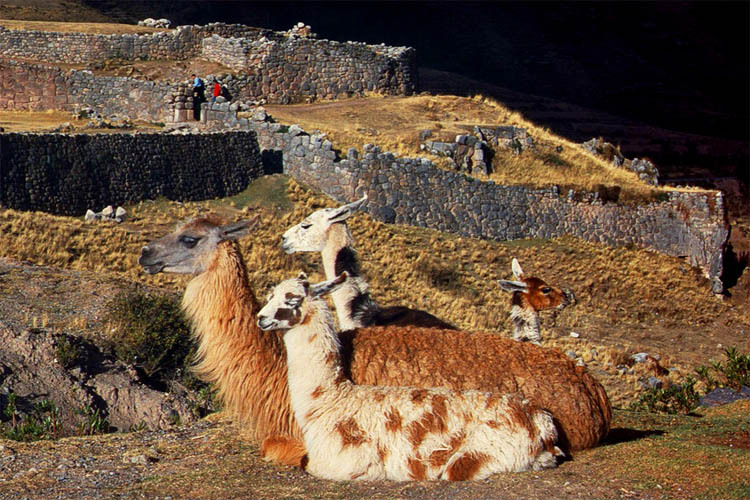 If you want to get an idea of how the Inca soldiers, the priests, the virgins of the Sun god and the Inca ruler himself looked like in their traditional costumes then you have to be here on June 21, any year, to watch a historical spectacle in front of the fortress. Enough material is still around. 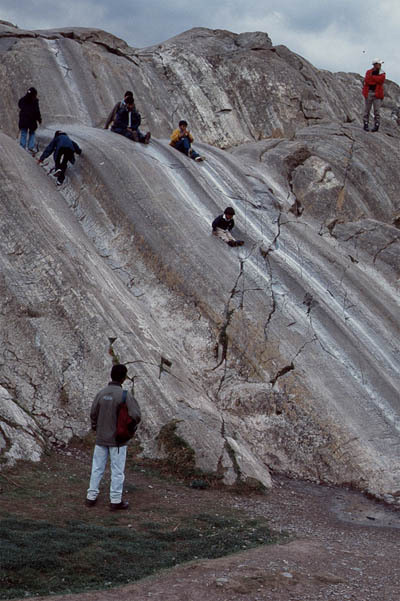 Maybe it was too difficult to cut stones out from a rocky mound, which is also so smooth that kids use it as a slide. 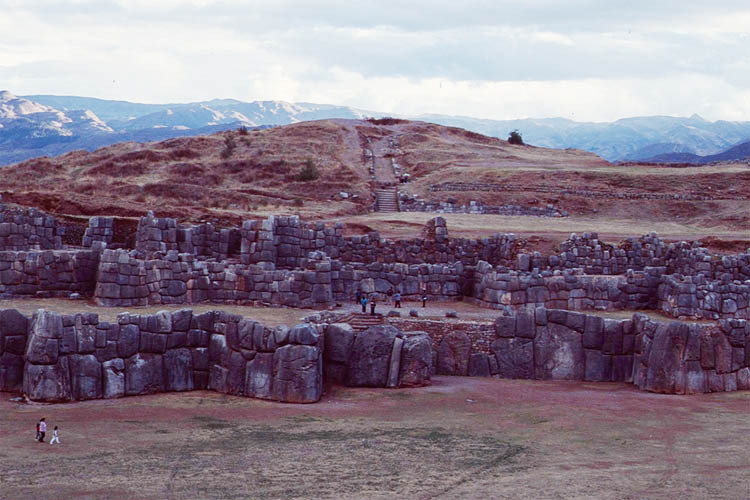 On the mound of the fortress itself was the "Temple of the Sun", which was eradicated by the Spaniards. 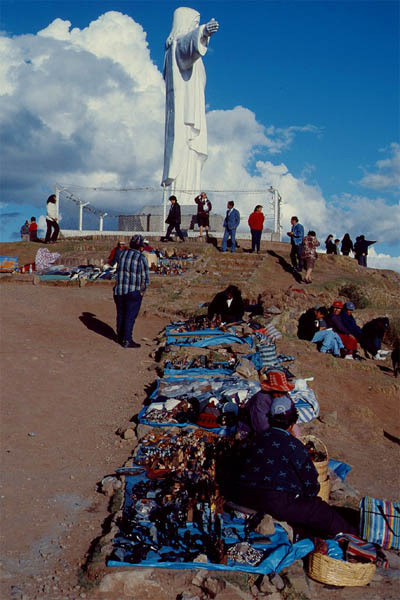 Since they could not build a church to cover it up, they erected a Jesus statue a little higher on a hill close by. 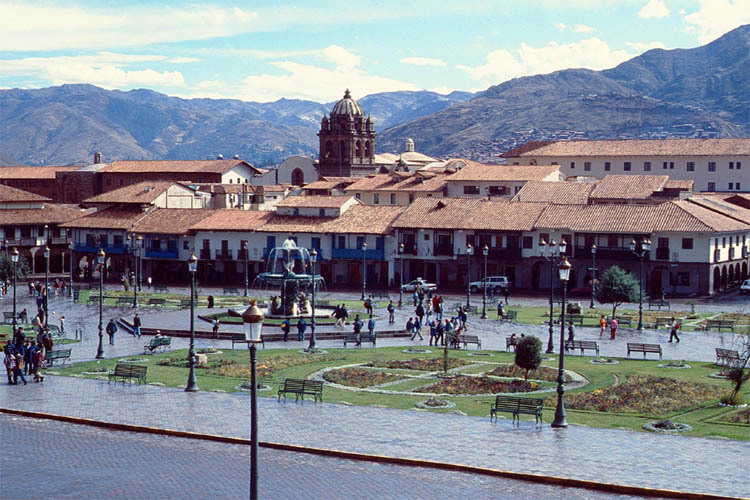 The Plaza de Armas was my favorite place, more so a café on the second floor in one of the surrounding houses with the arcades and looking down from the veranda, even on a rainy day, while having a coffee and cake. But there is much more to see around that plaza. On a rainy day it is nice to visit and pray for the sun in the "Temple of the Sun" under the church of Santo Domingo (see photo above). 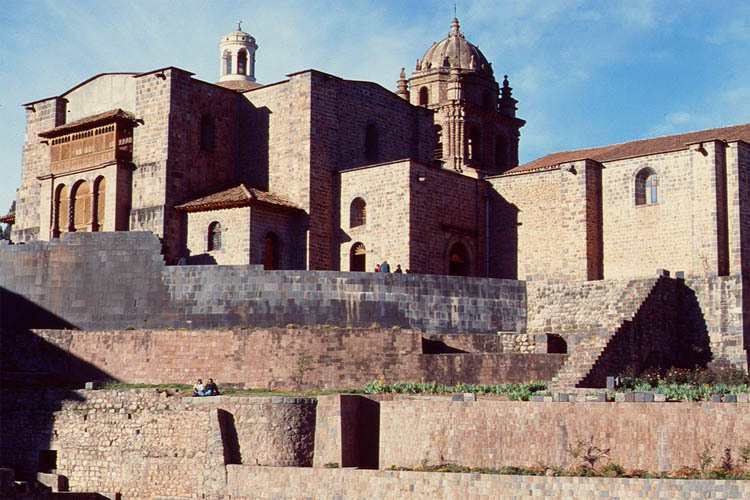 Yes, here the Spaniards did really cover up the Inca temples by building a church on top. 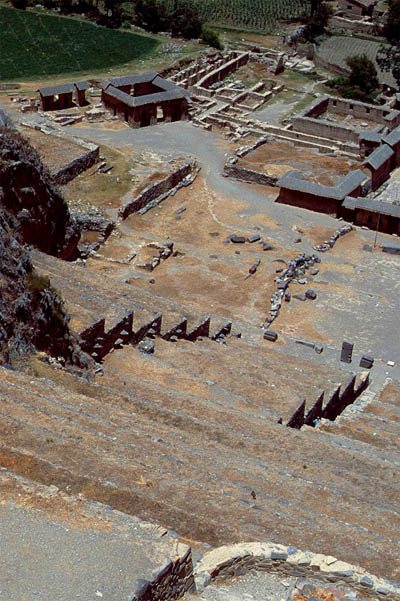 It was just luck for the archeologists to detect that Sun temple beside many others in the year 1950 after the church crumbled during an earthquake. 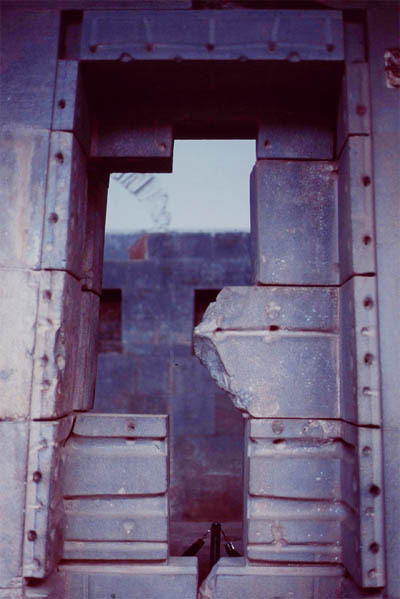 No harm was done to the walls of the temples underneath. 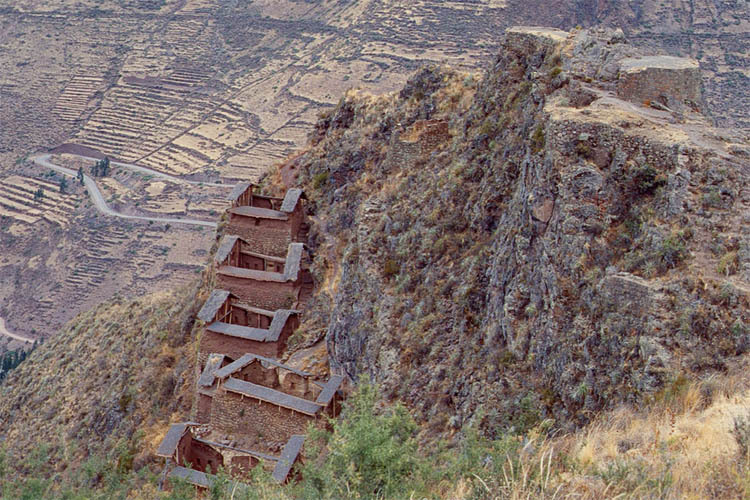 The Incas new how to build earthquake resisting buildings, the Spaniards did not. Take a look at the precisely cut stones yourself. This time they are all rectangles and piled up with interlocking bolts. 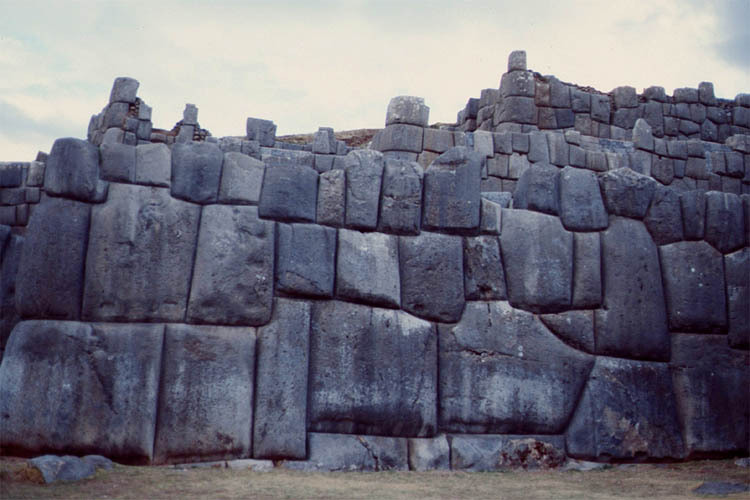 Each layer of stones is also set off by 10cm to the inside thus becoming some kind of a trapezium shape. 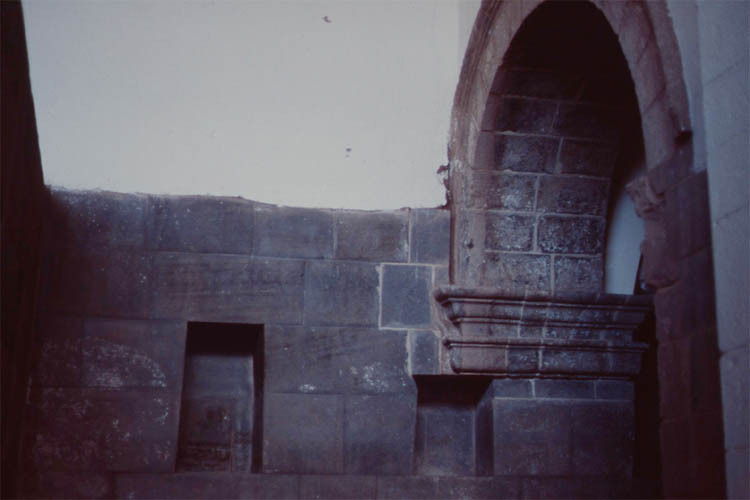 This makes the temples even more robust; the walls can neither fall to the outside nor to the inside in case of an earthquake. 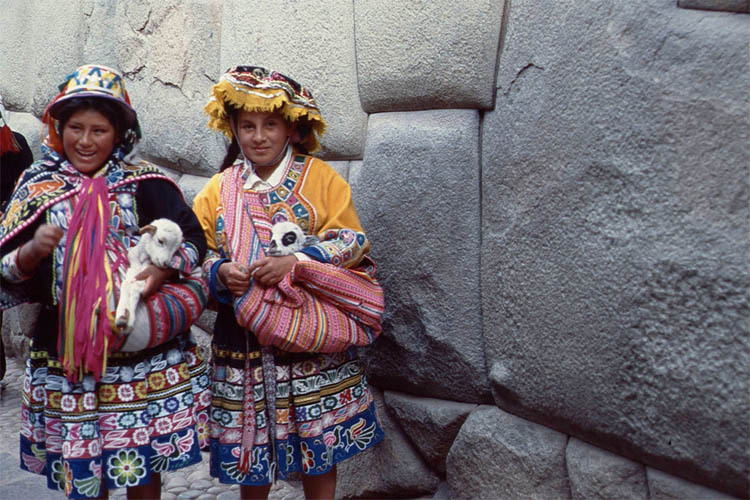 The Incas must have been geniuses. But why didn't they invent the wheel? Why didn't they have a script? Why didn't they push the few Spanish conquistadors back to the sea. 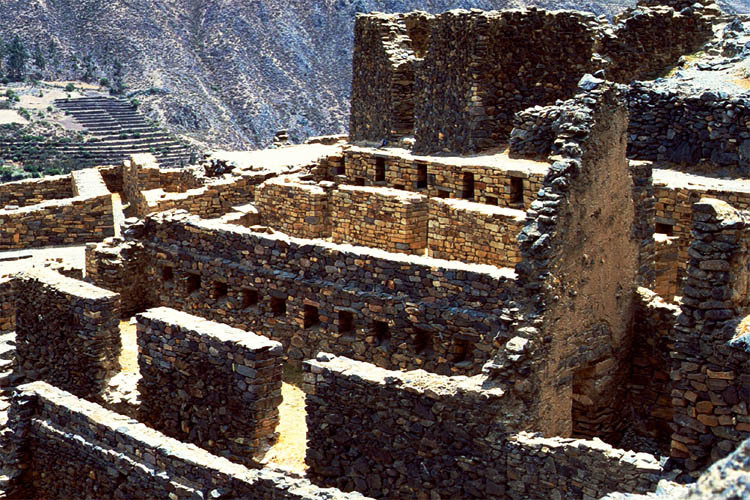 The latter was probably that the Incas trusted the Spaniards and didn't expect them to be so mean and cruel and outwitted. 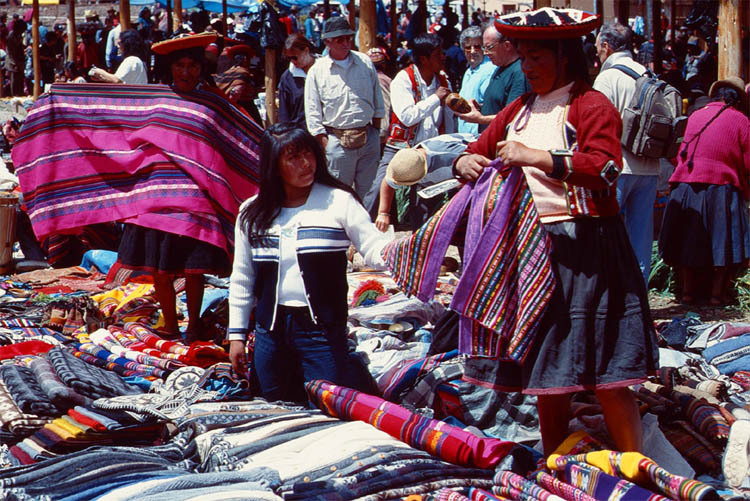 But on the other hand: the Incas also conquered and ruled half of South America with an iron fist, all before the advent of the Spaniards. What to do next day on a Sunday. 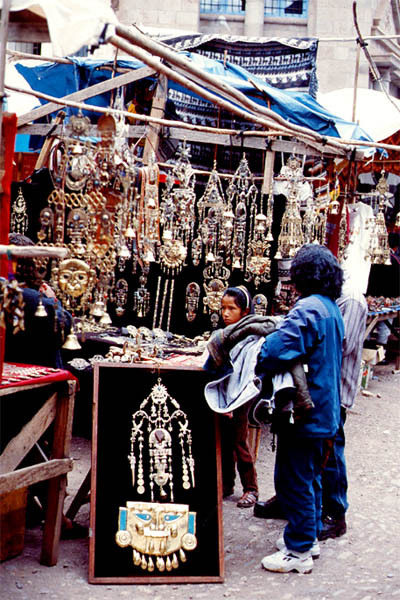 To visit another Sunday market, of course. 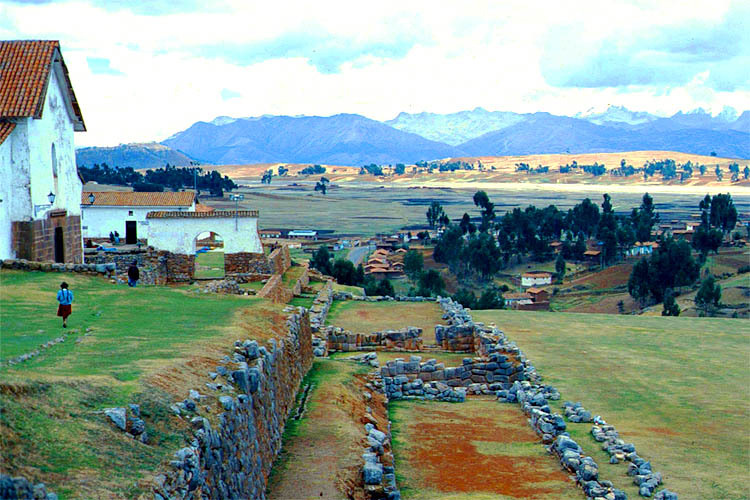 This time it's Chinchero, a small town just 50km from Cuzco. 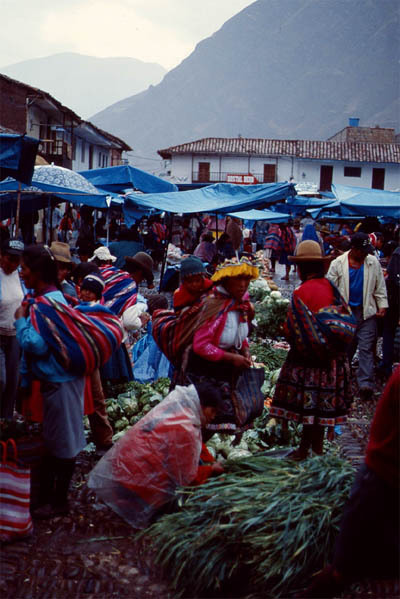 This market was originally mainly a vegetable market. 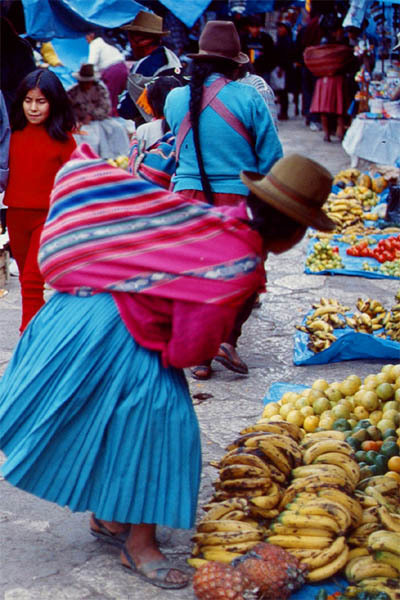 But the tourists who started to come by the bus load didn't buy veggies. What a pity. So the people did get the clever idea to offer things the tourist might buy and the transformation took place. 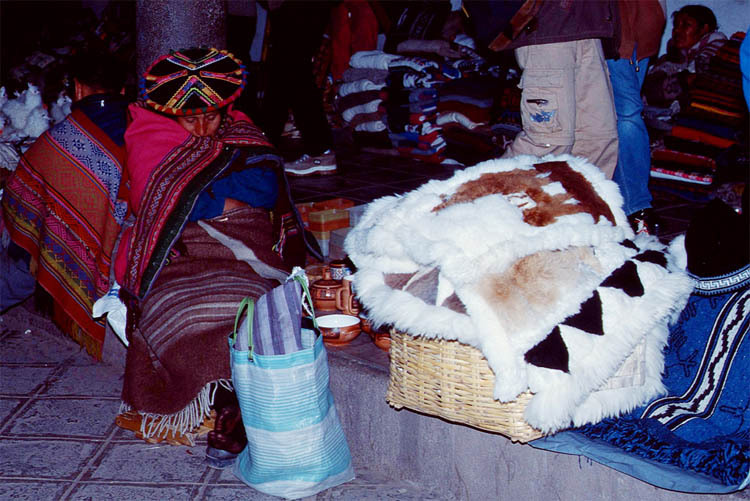 But I was not interested in buying nice cloths or clothes or bags or hats but to watch the indigenous people wearing all those things, especially their hats. 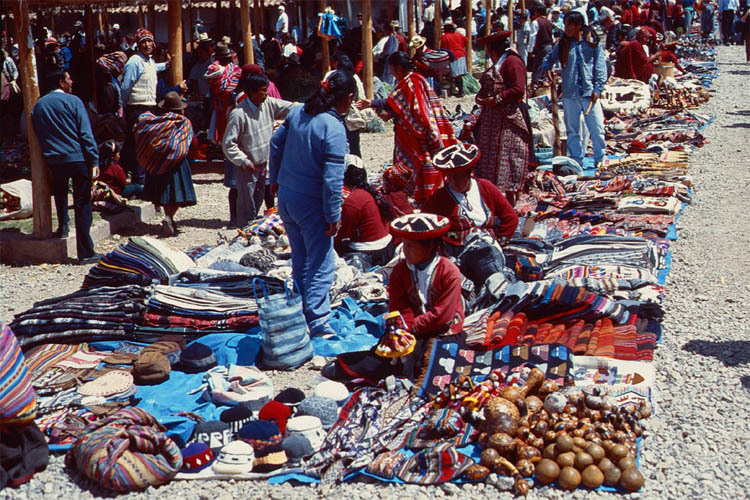 And there are many different styles, from the Indigenous flat colorful round hats to European and American hats. 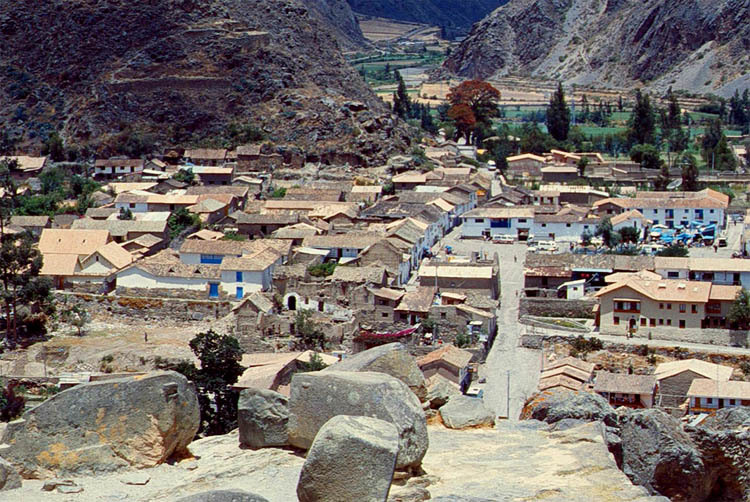 This town was actually an old agricultural center of the Incas. 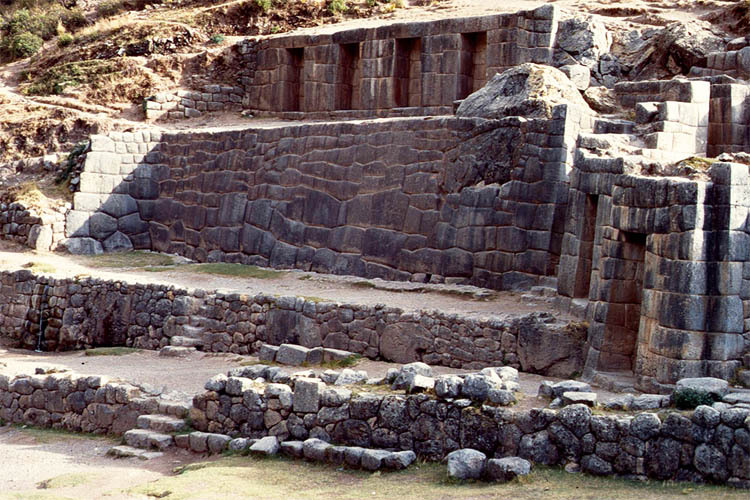 Some remnants of an Inca palace can be seen in the court yard and behind the church, which is the only dominant structure around. What a pity. 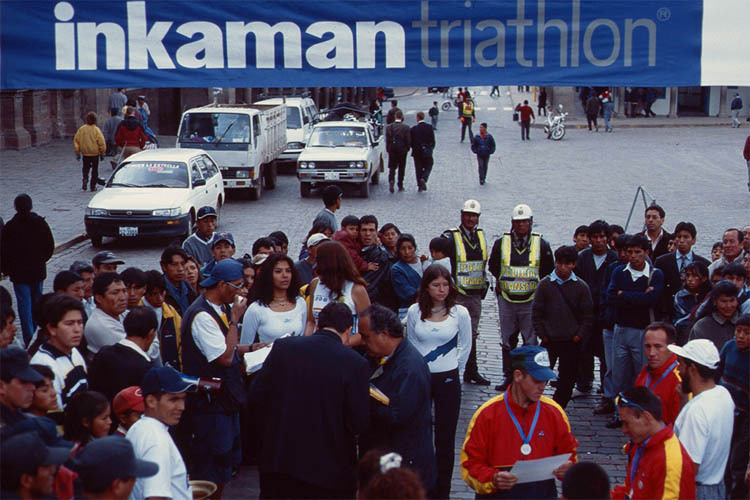 I missed to join the inkaman triathlon. But I was not enough acclimatized in an altitude of 3430m anyway. And I had to be strong to continue my Spanish marathon the following Monday for another week. 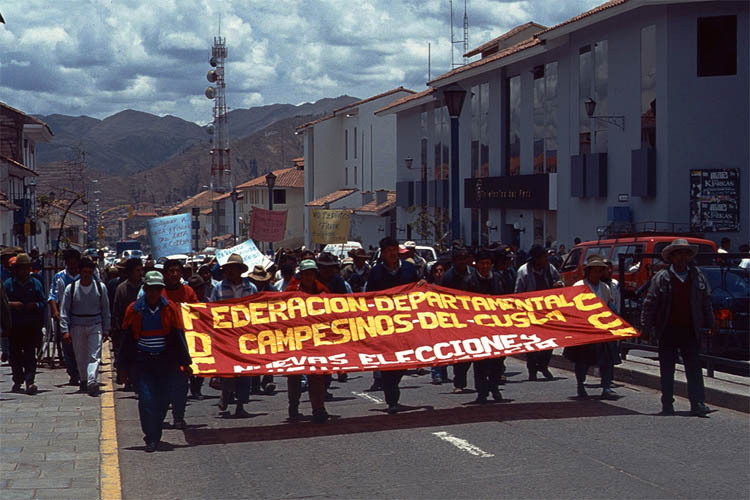 Joining a demonstration was also not my thing even if I agree with the cause and plight of the campesinos, the farmers, of Cuzco. 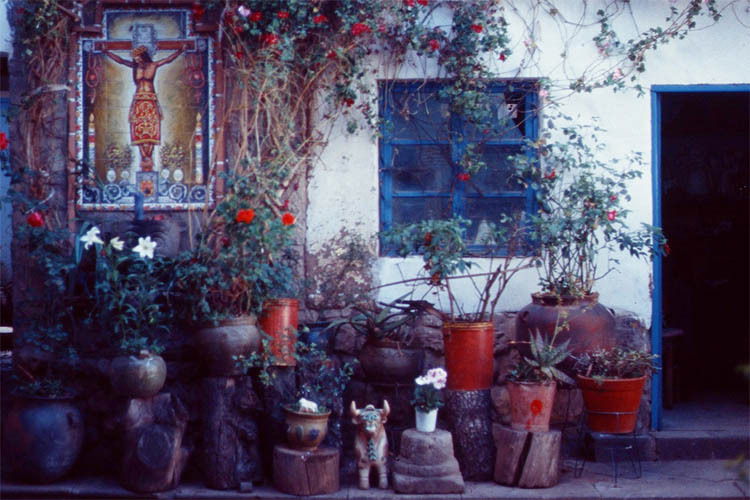 I rather strolled along the small and narrow alleys and lanes in the artist quarter around the Iglesia San Blás while browsing in small old shops stuffed with paintings, carvings and all kinds of antiques, real old or faked old. I didn't care. 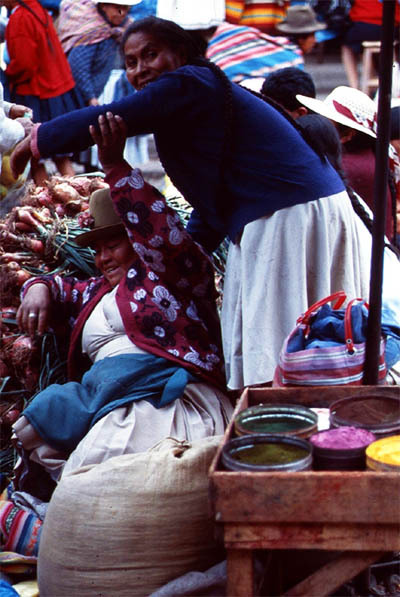 Only some figures showing sexual acrobatics supposedly performed by the Inca I would have liked to buy but did not dare. After that I relaxed at some of the sidewalk cafés before I went back to my home stay.